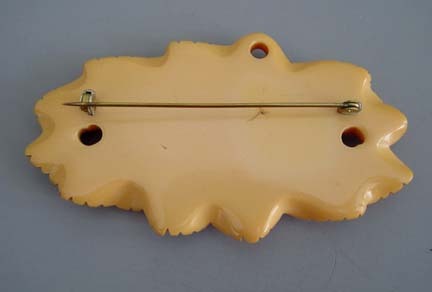 #B13691 back hinge, 6-1/2" by 7/8". 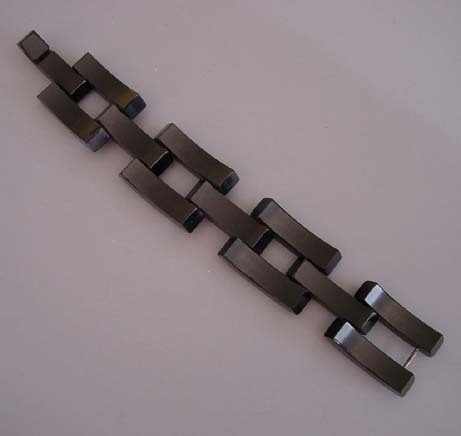 #B14004 side hinge, 6-1/3" by 1". 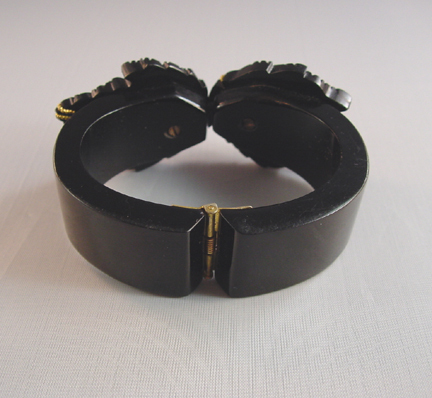 #B18090 side hinged with added safety, 6-1/8" by 1". 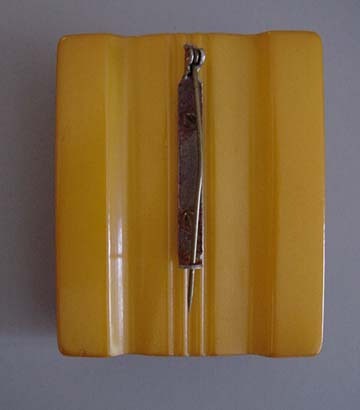 #B13692 back hinged, 6-1/4" by 7/8". 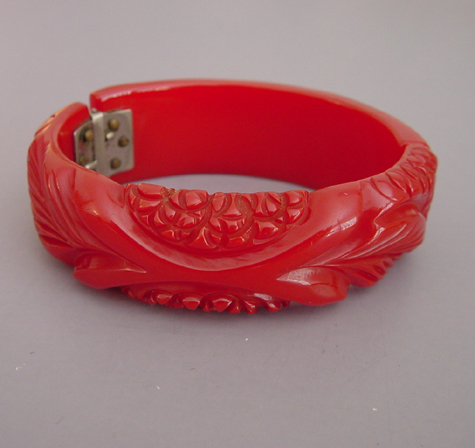 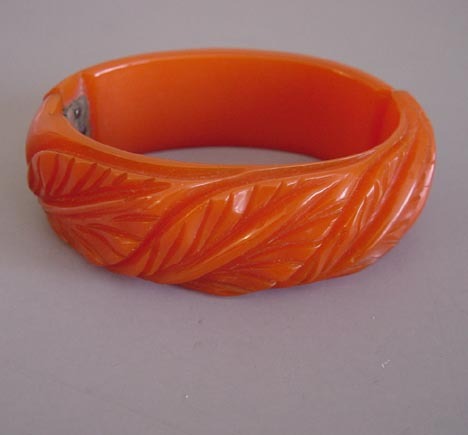 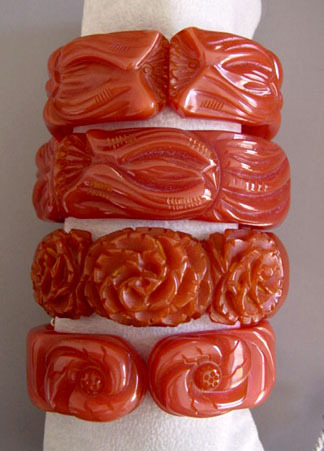 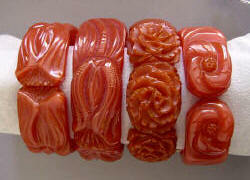 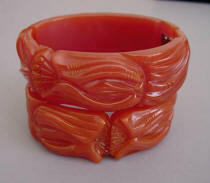 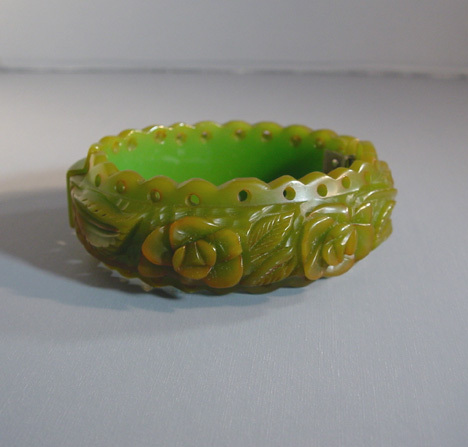 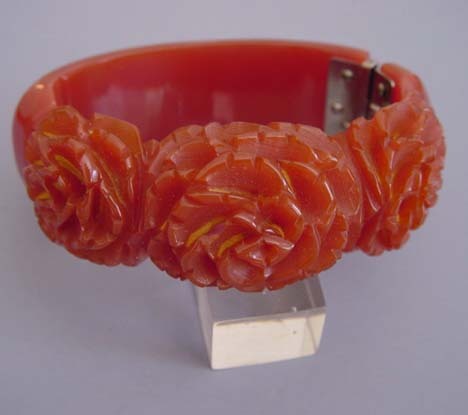 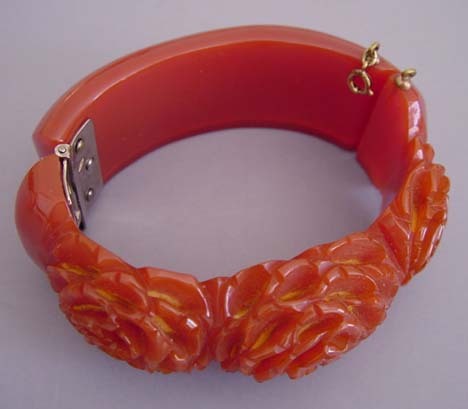 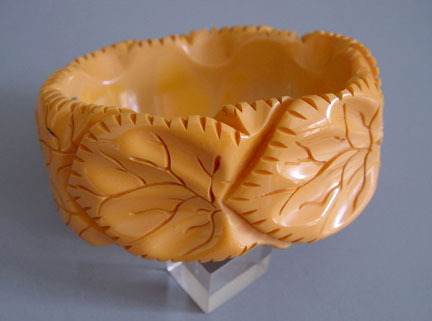 BAKELITE apricot translucent floral carved back hinged bangle, 6-1/2" by 7/8" by 1/3". 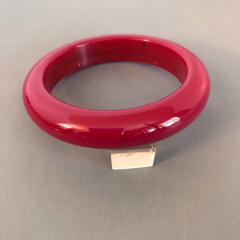 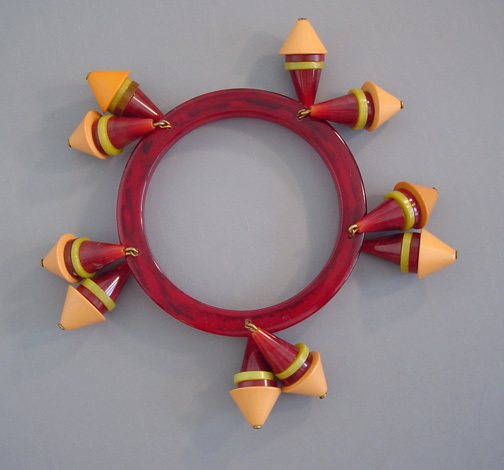 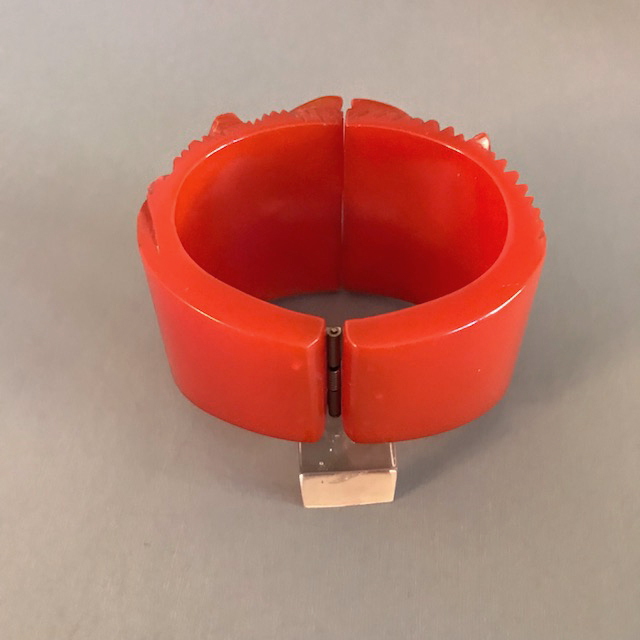 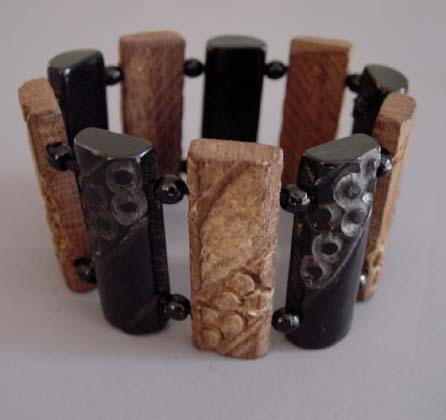 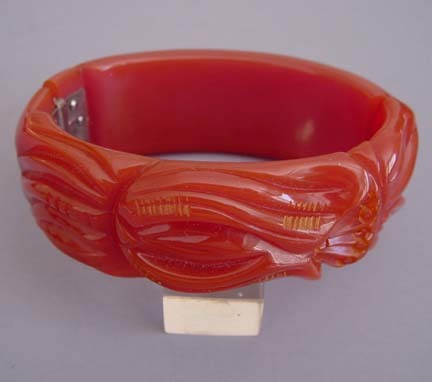 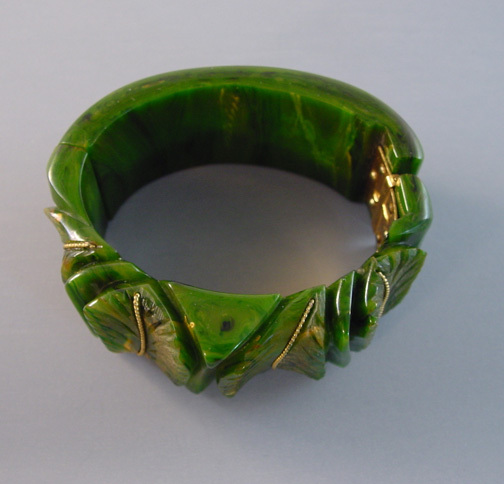 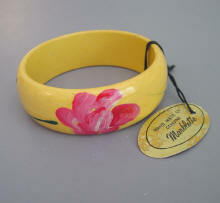 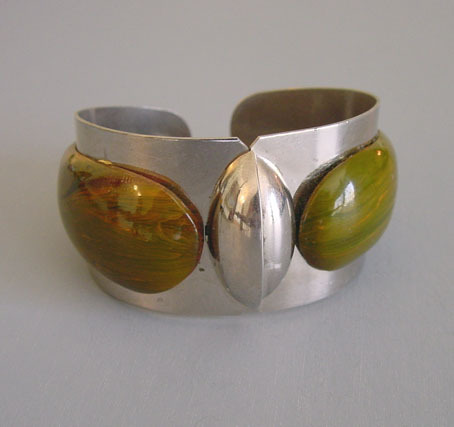 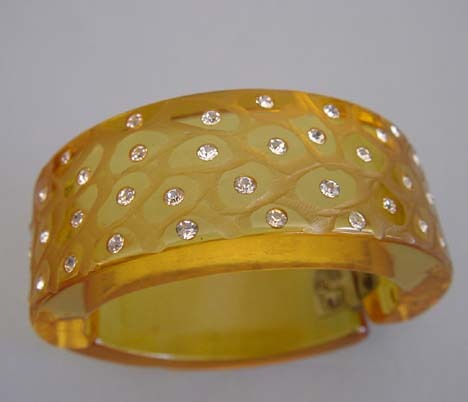 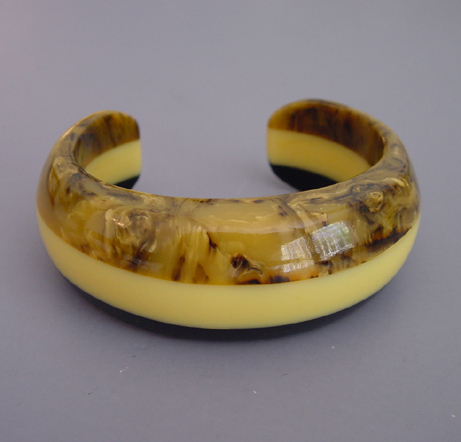 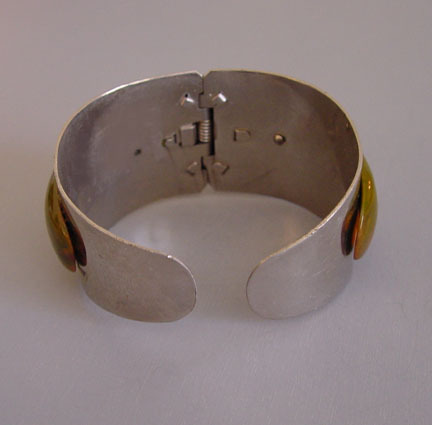 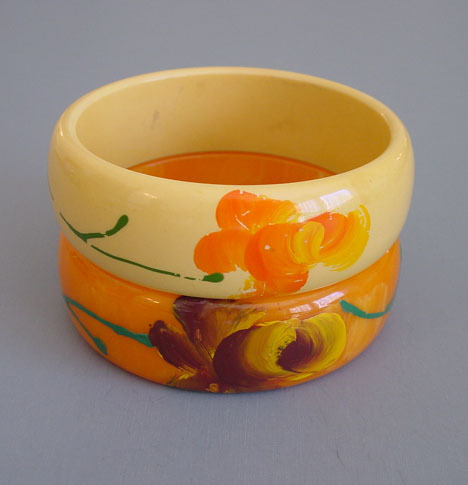 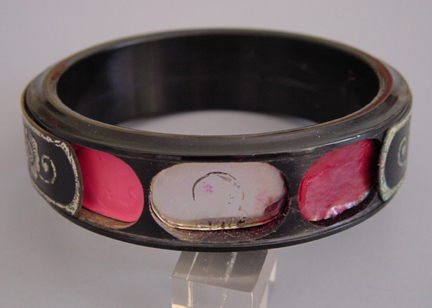 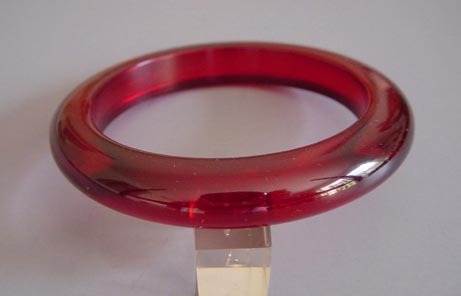 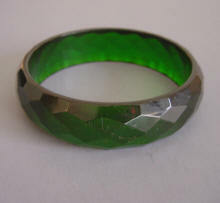 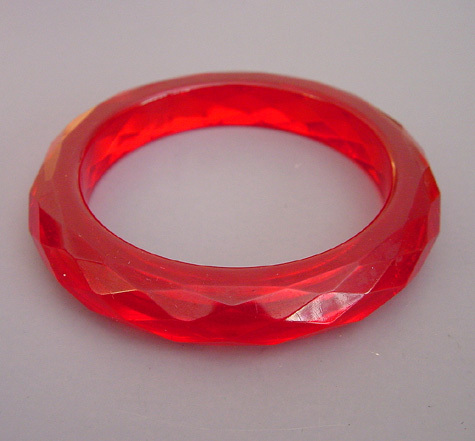 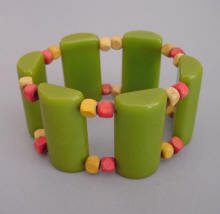 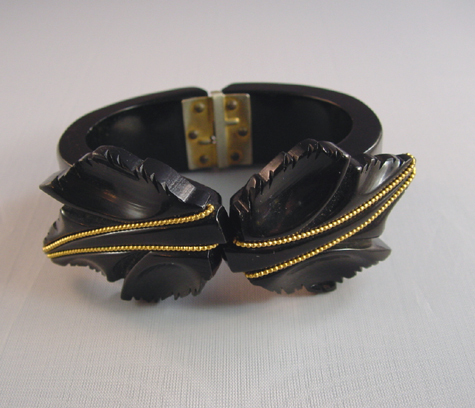 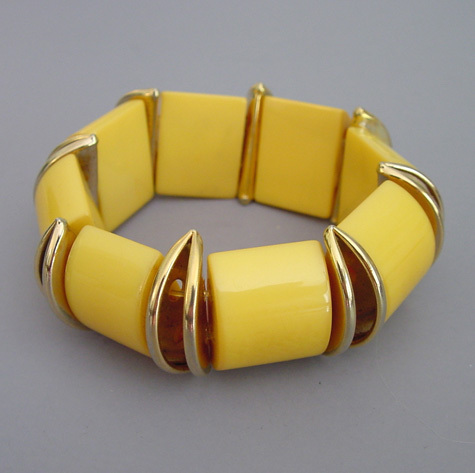 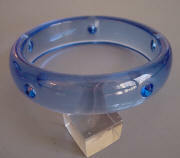 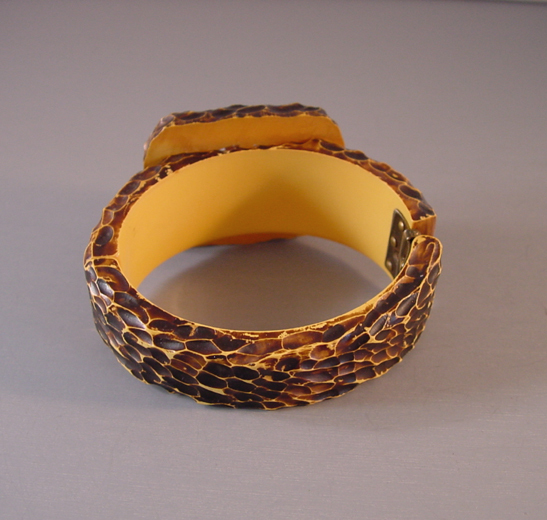 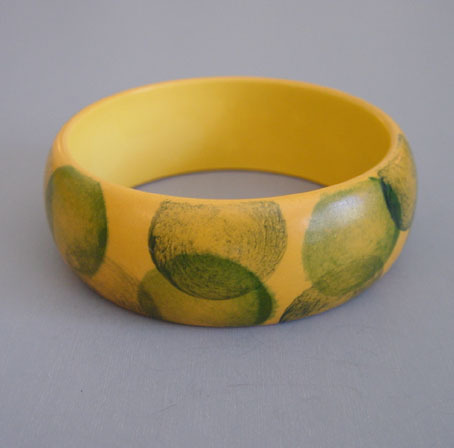 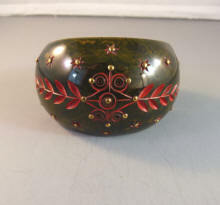 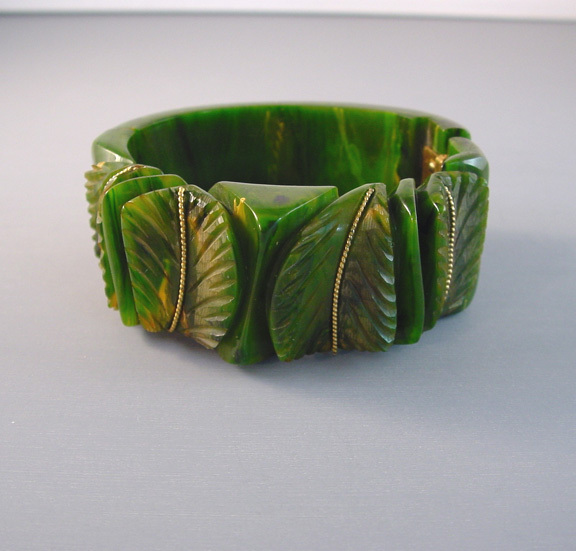 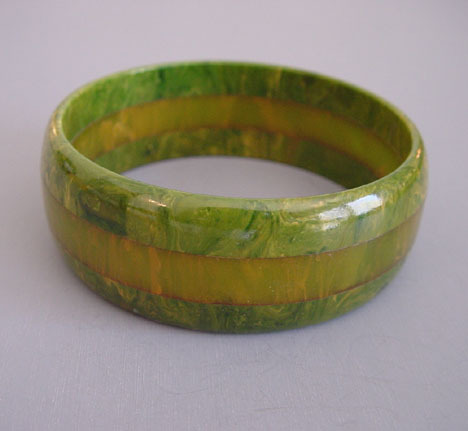 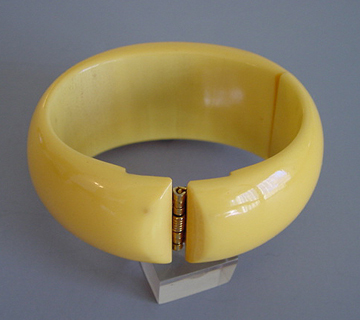 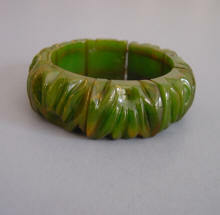 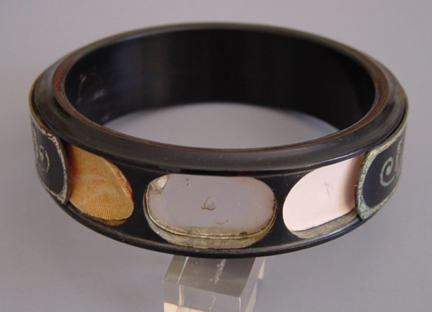 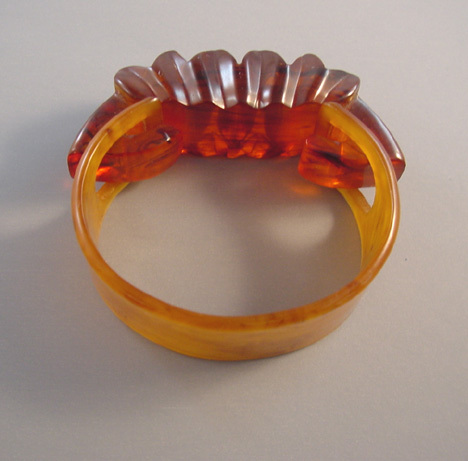 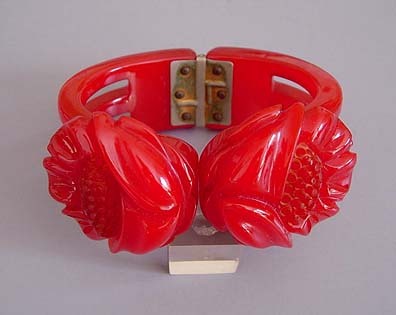 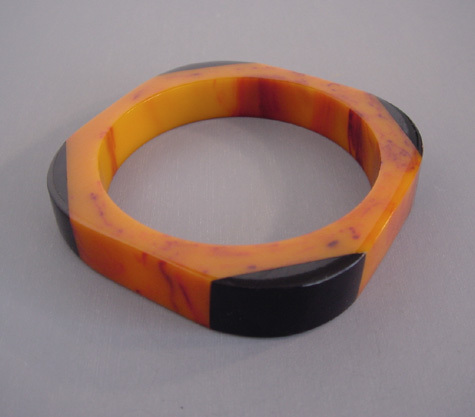 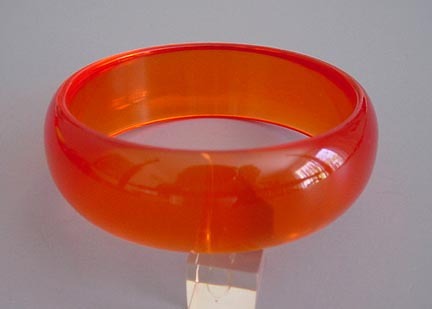 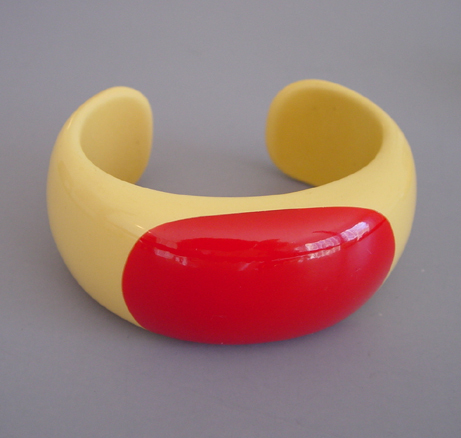 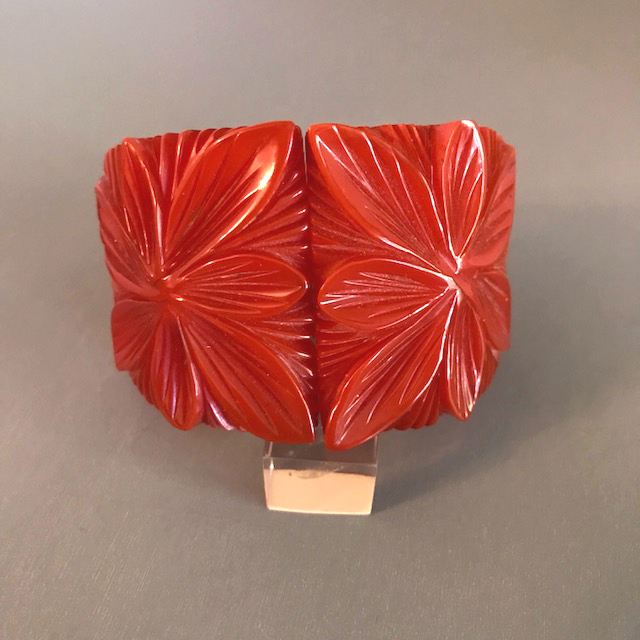 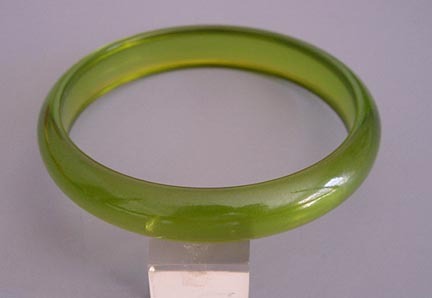 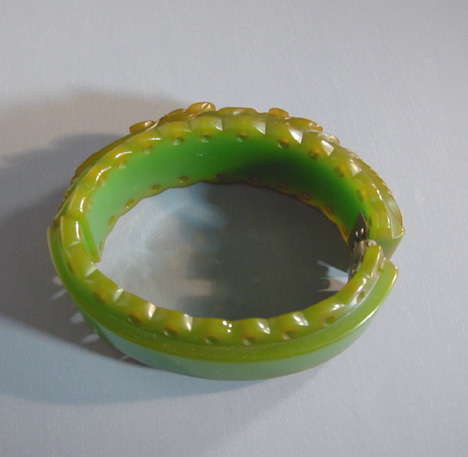 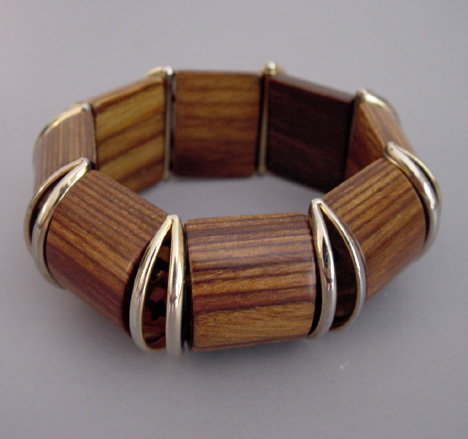 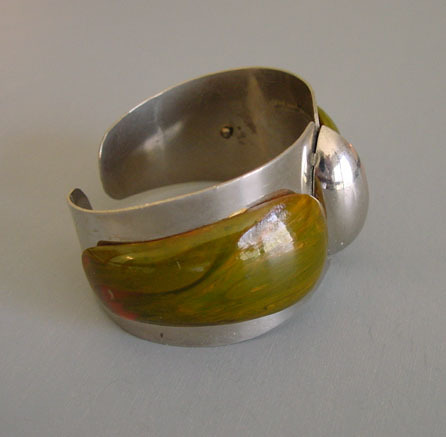 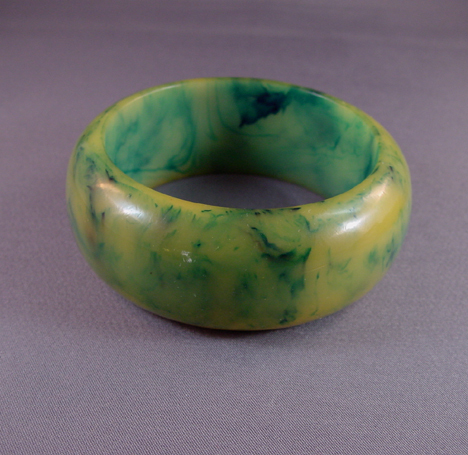 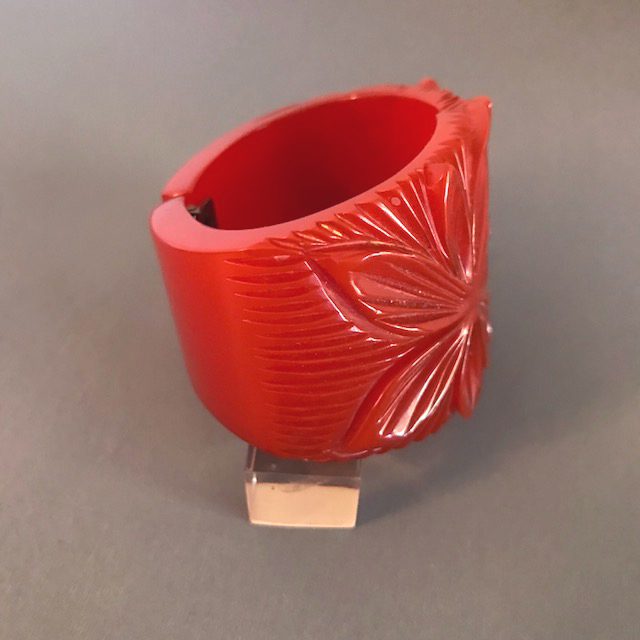 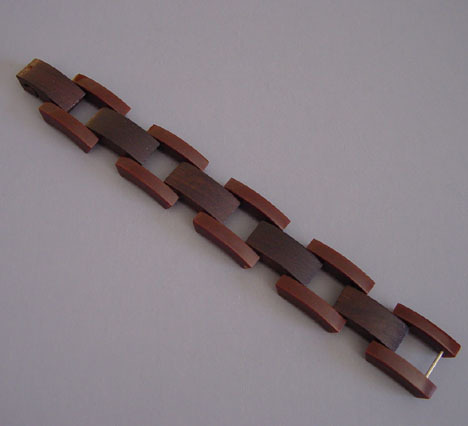 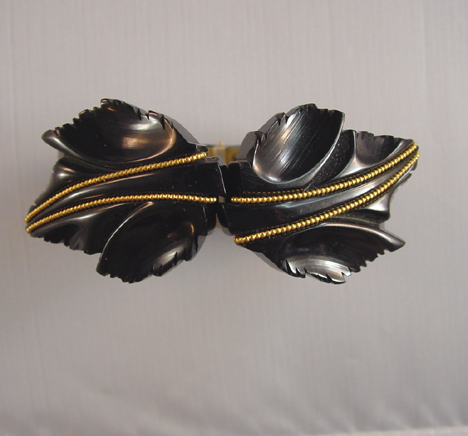 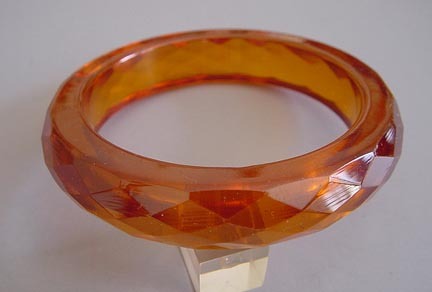 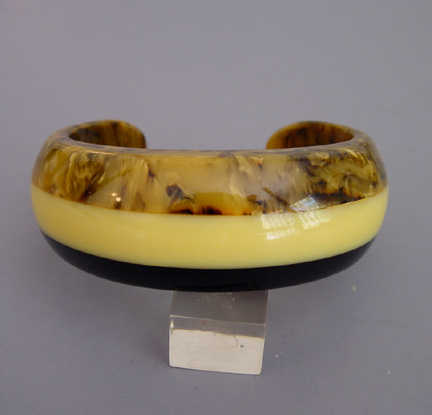 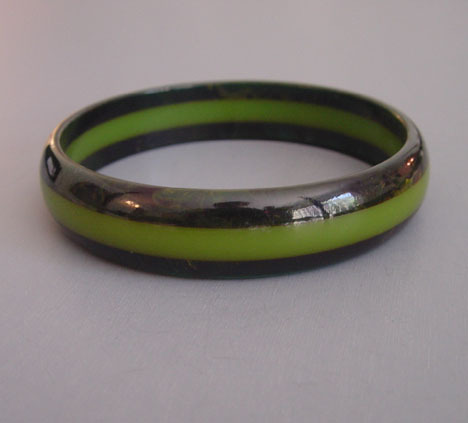 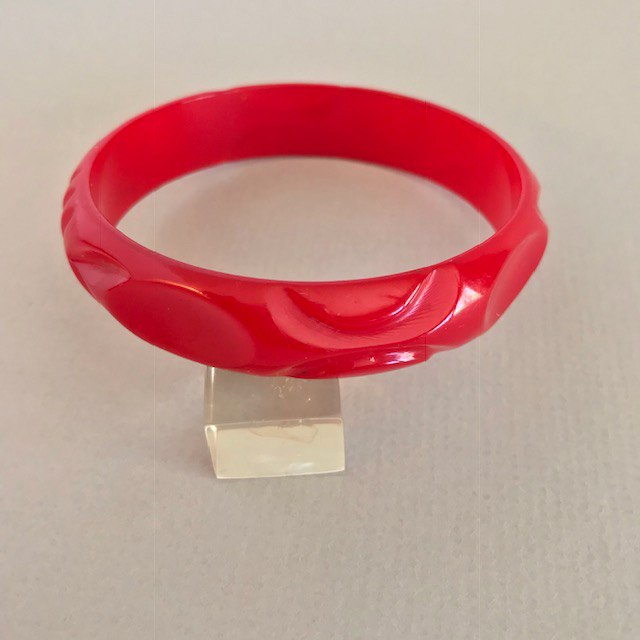 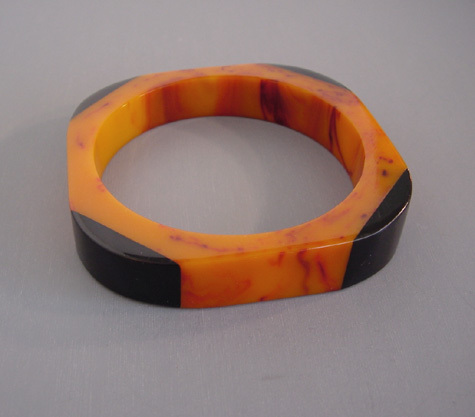 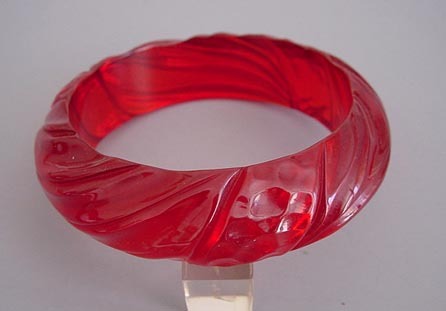 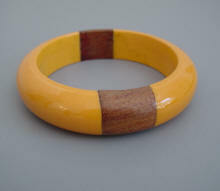 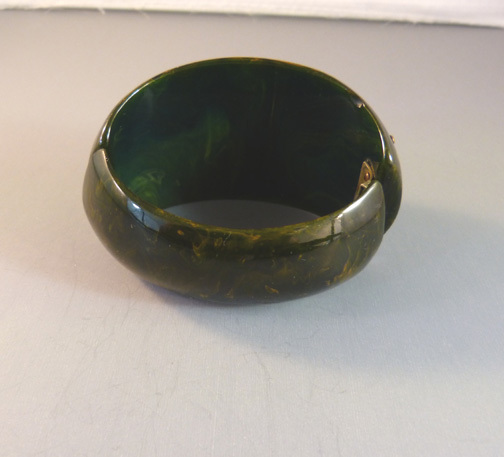 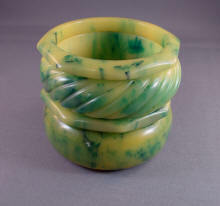 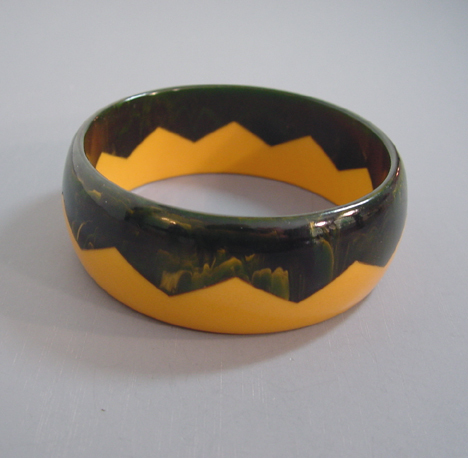 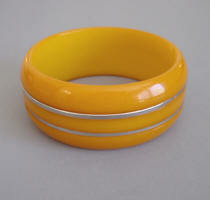 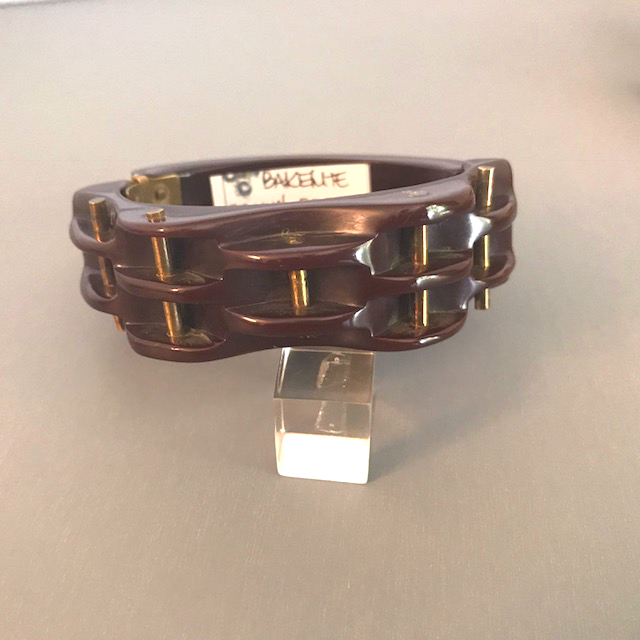 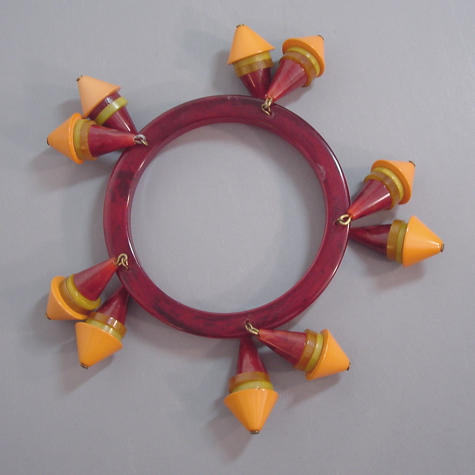 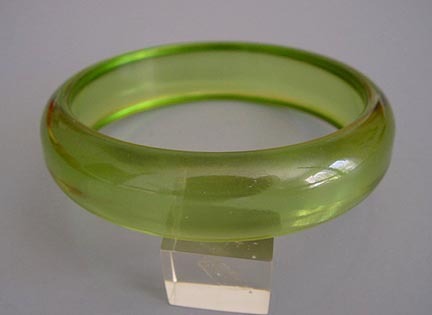 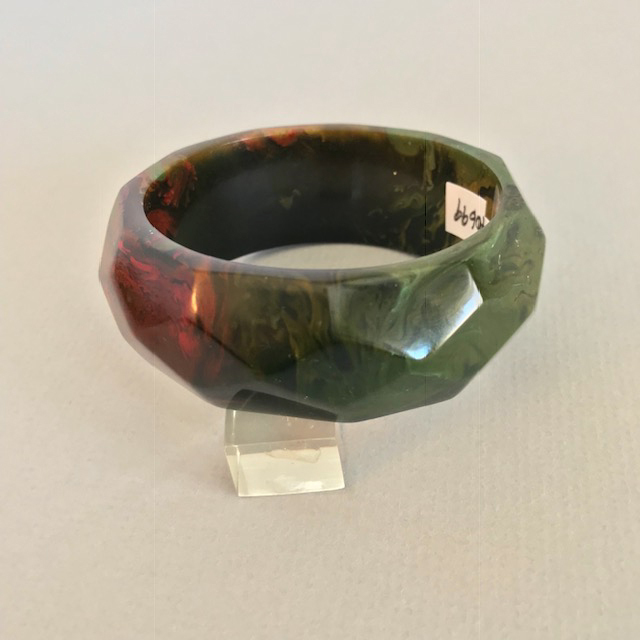 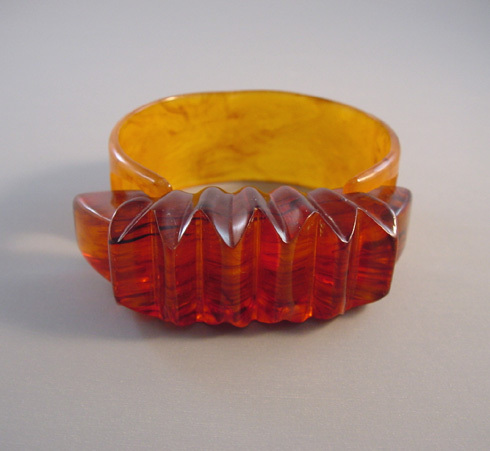 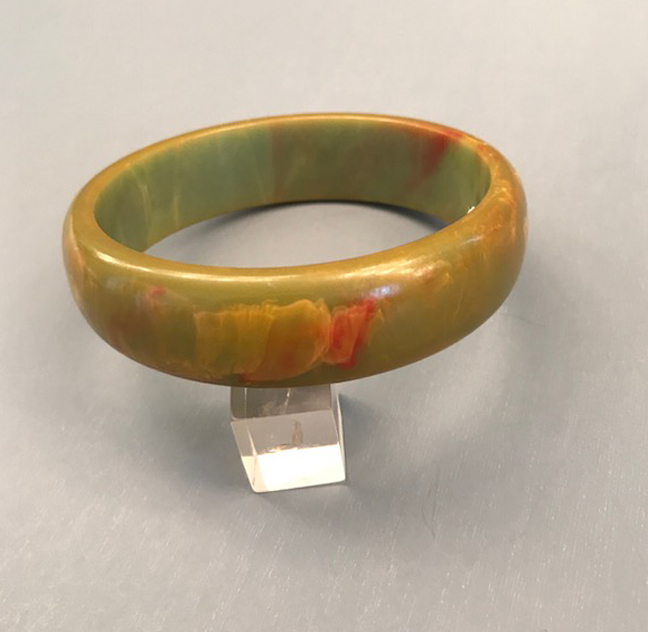 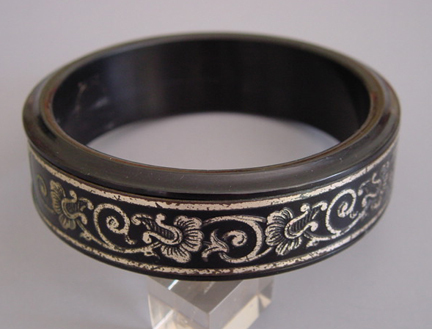 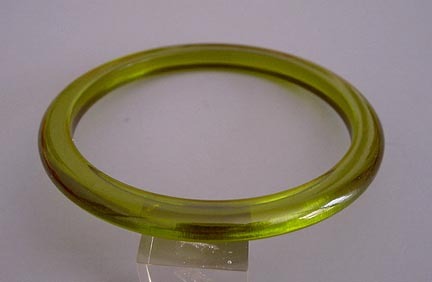 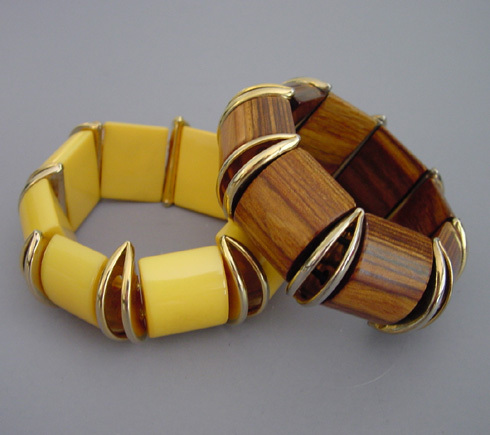 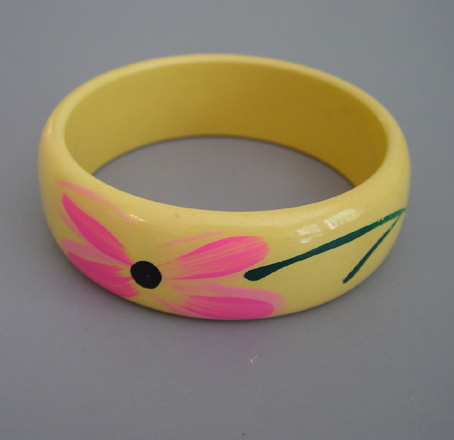 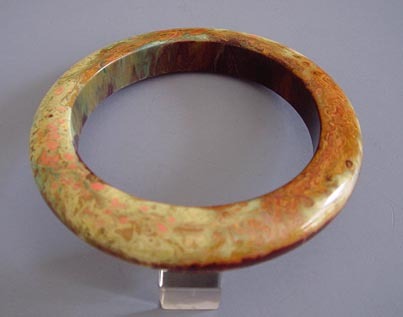 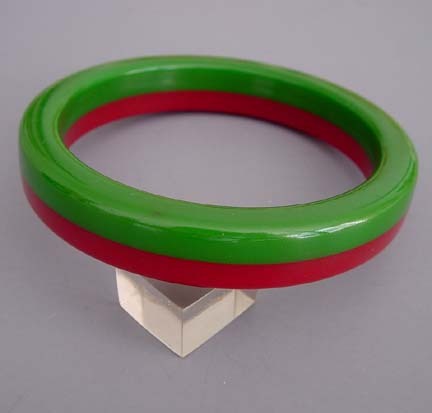 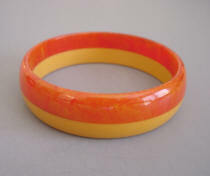 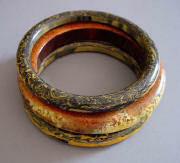 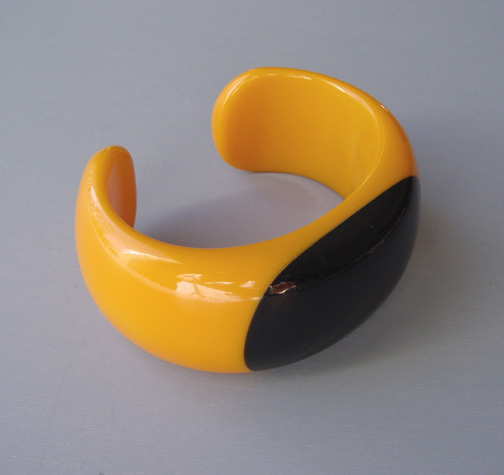 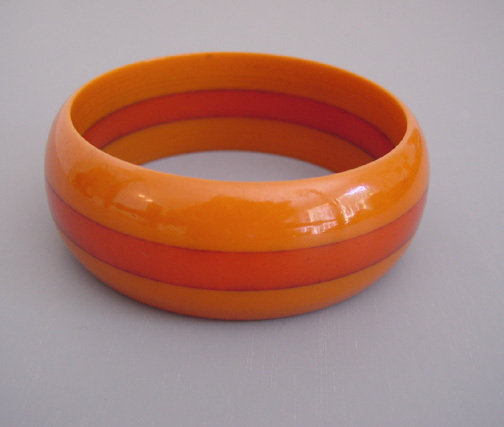 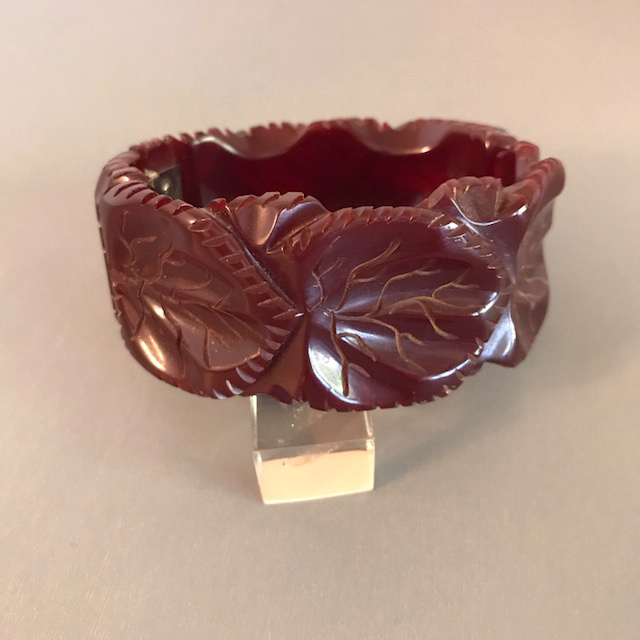 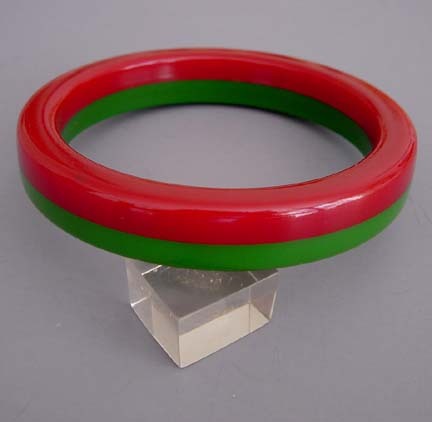 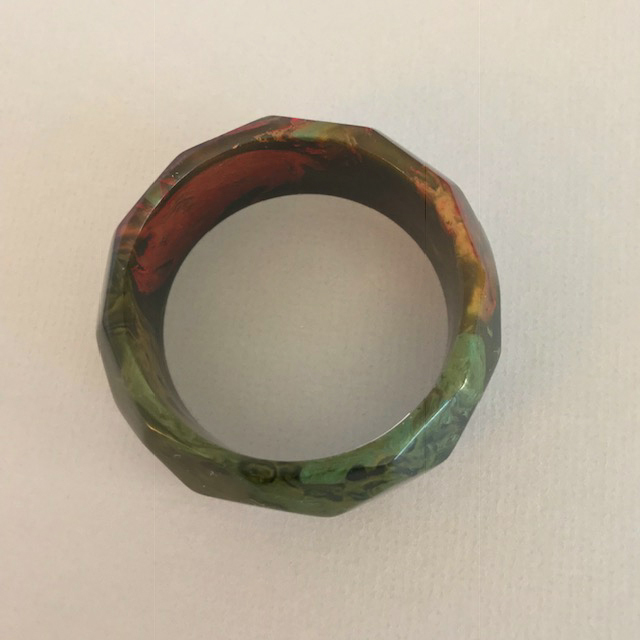 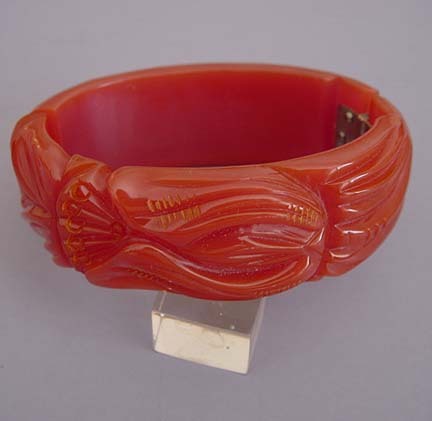 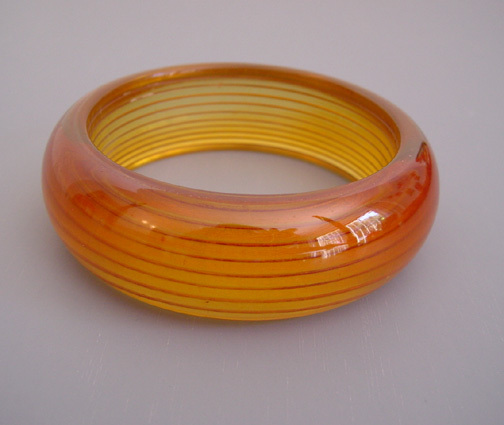 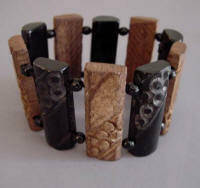 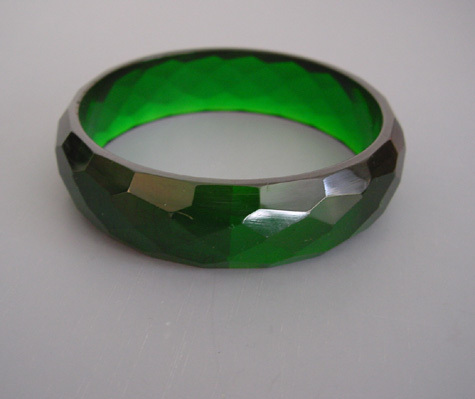 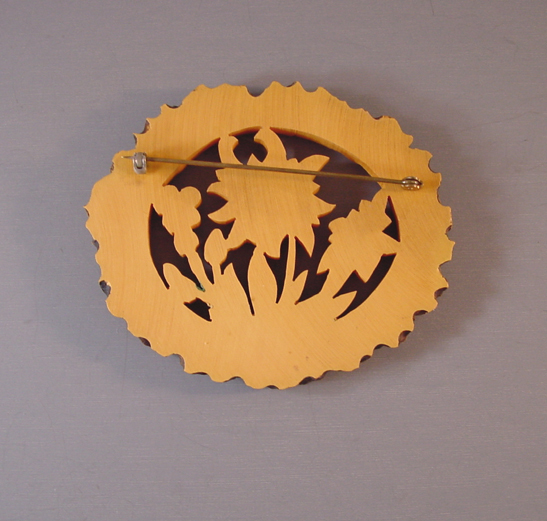 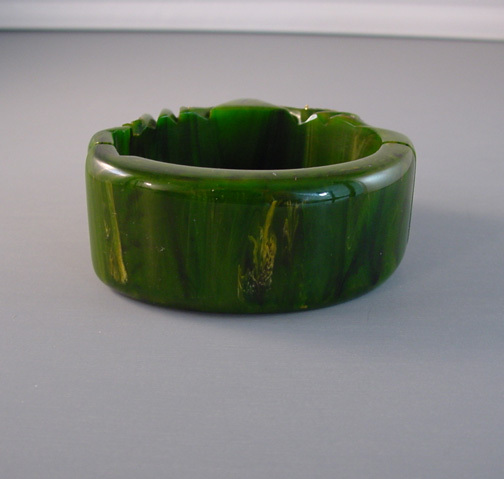 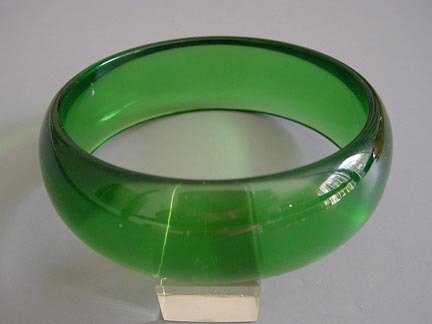 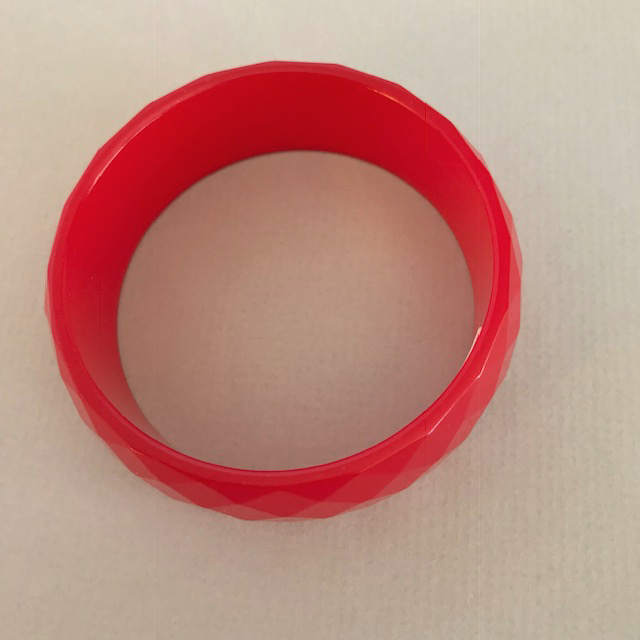 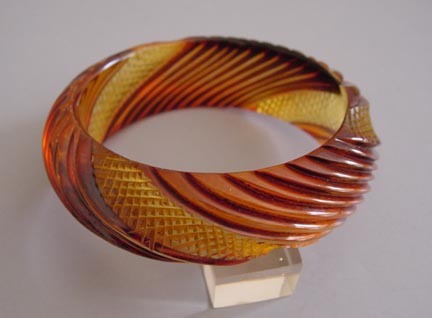 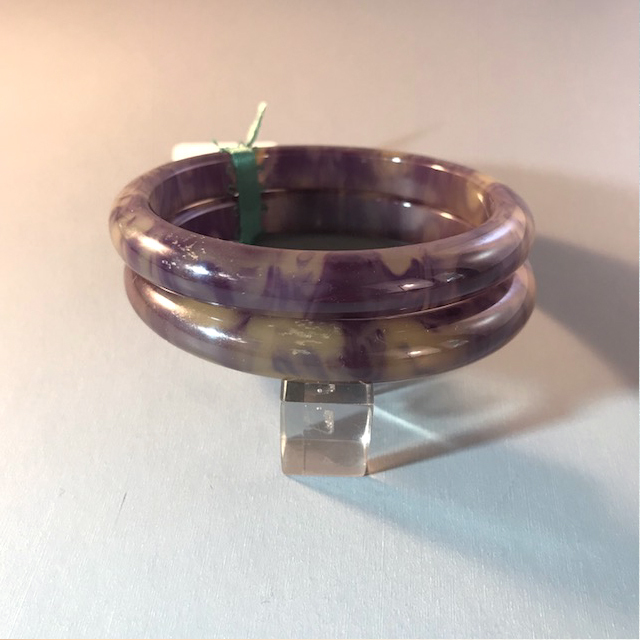 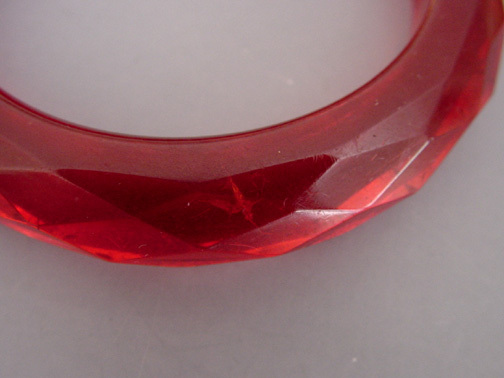 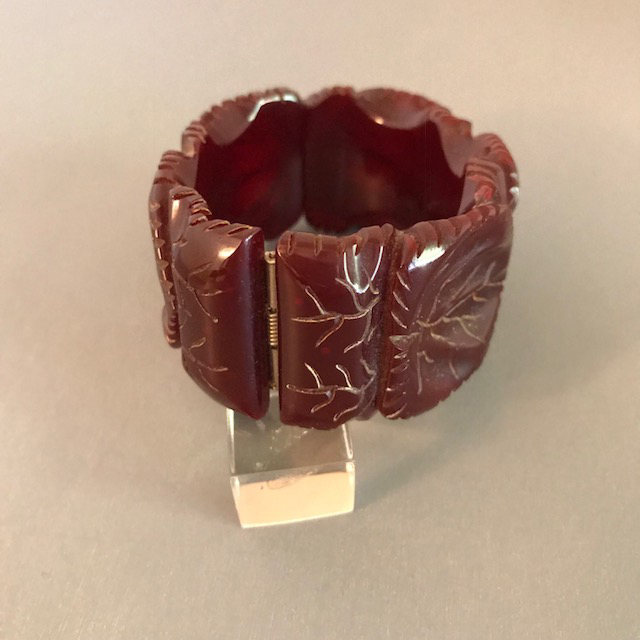 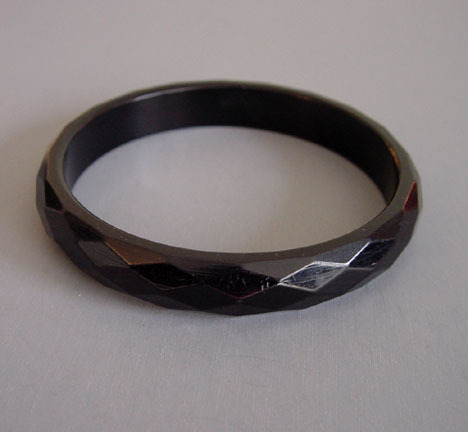 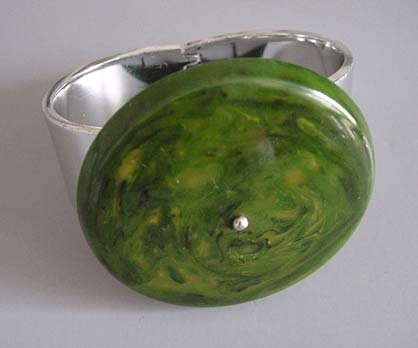 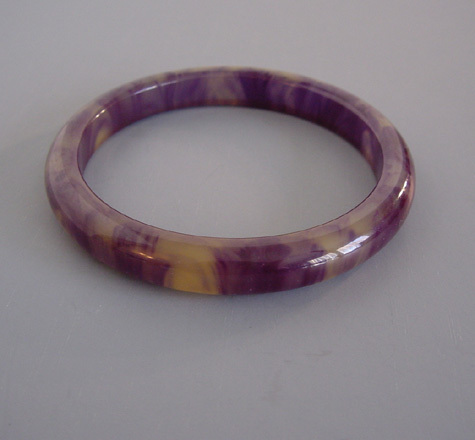 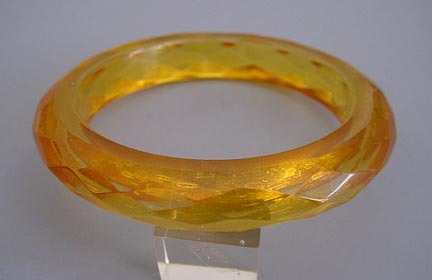 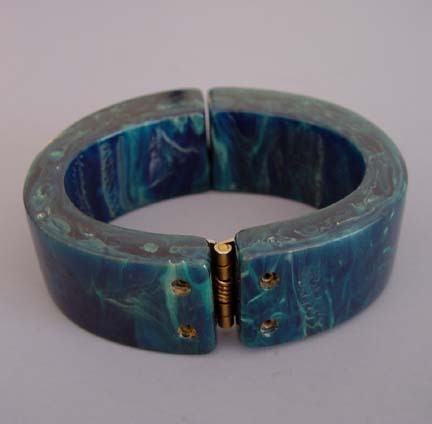 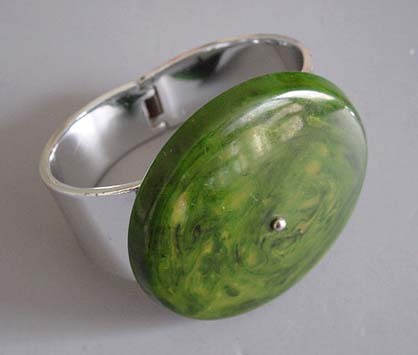 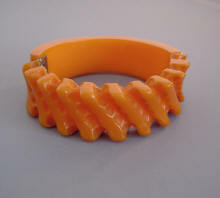 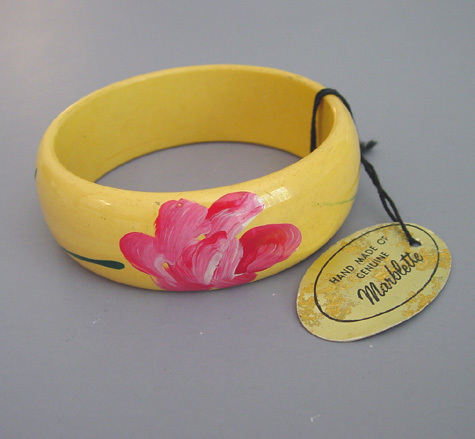 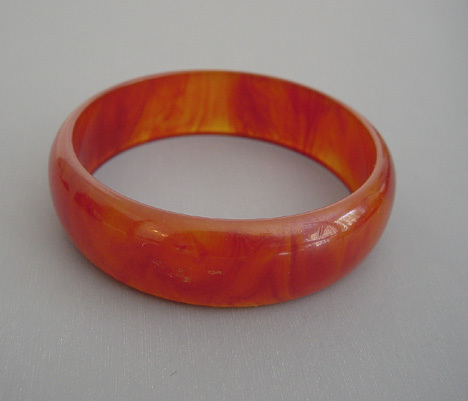 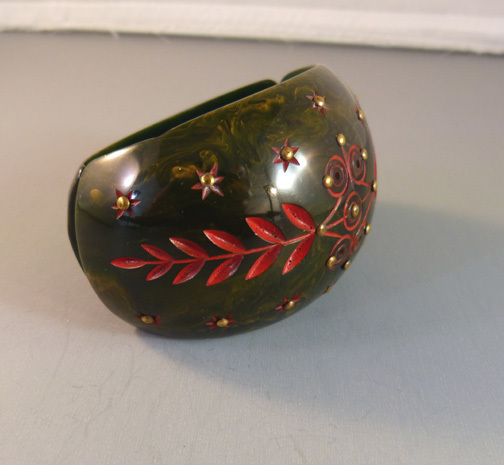 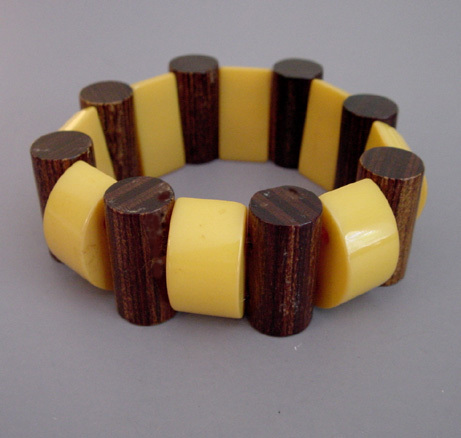 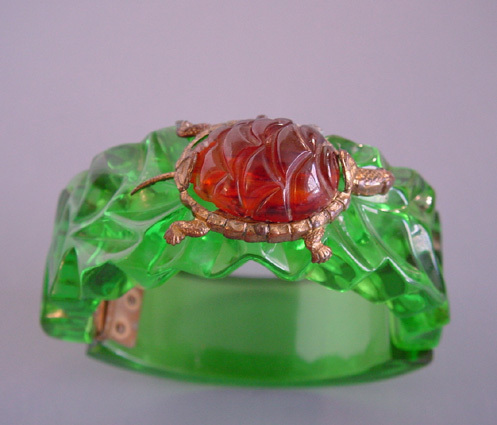 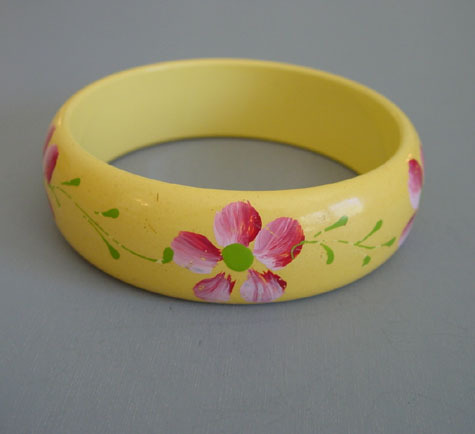 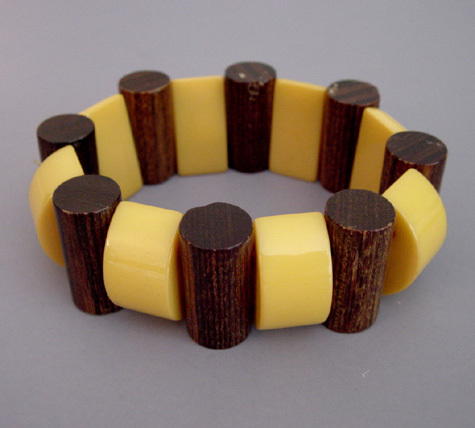 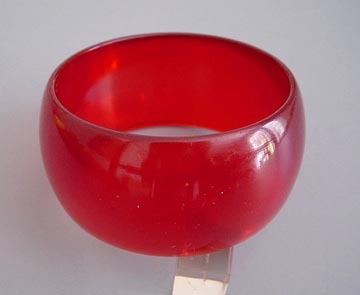 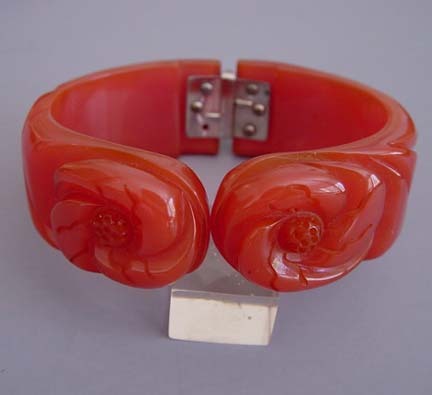 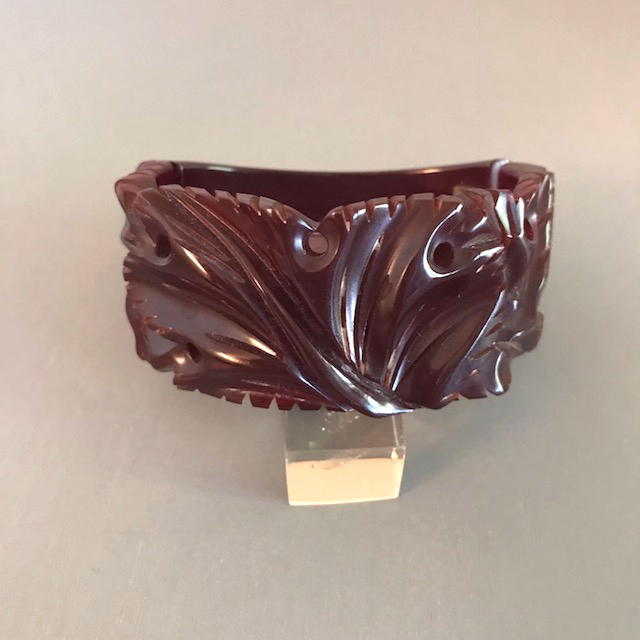 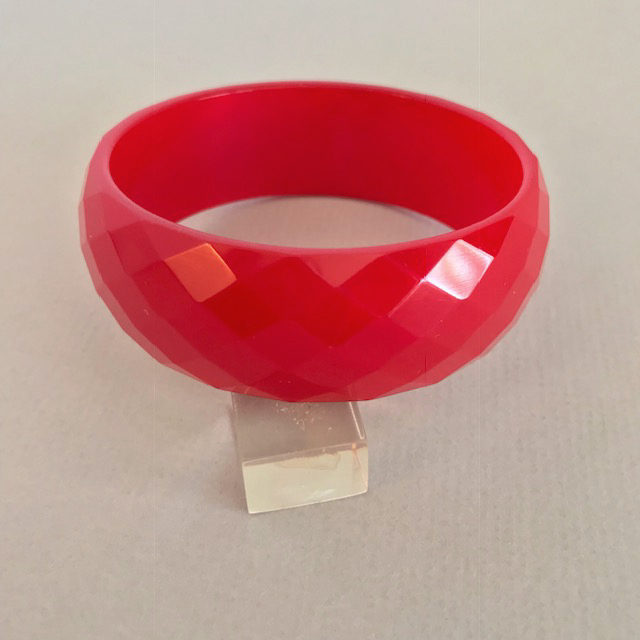 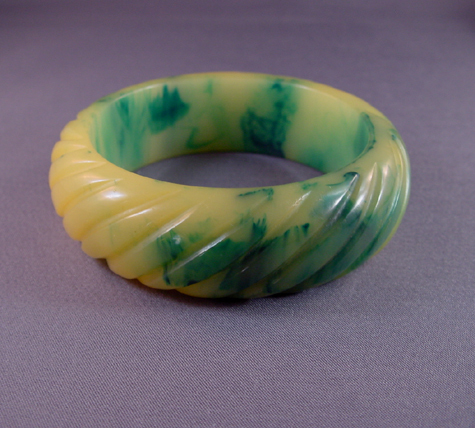 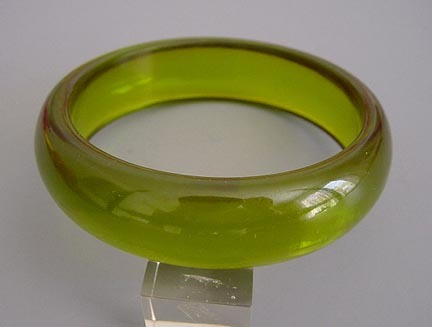 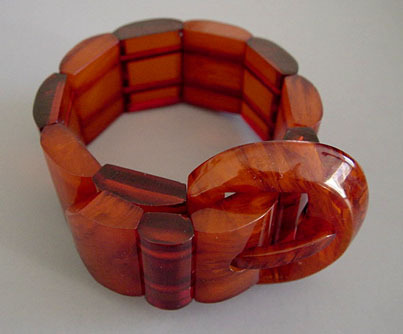 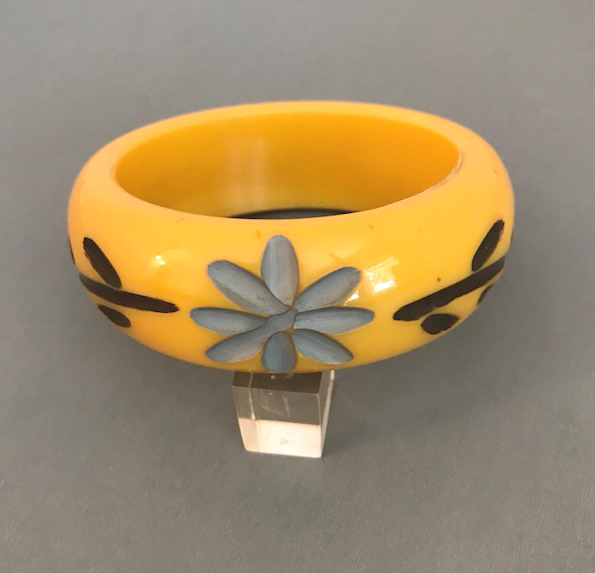 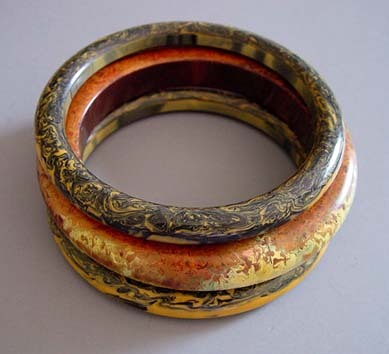 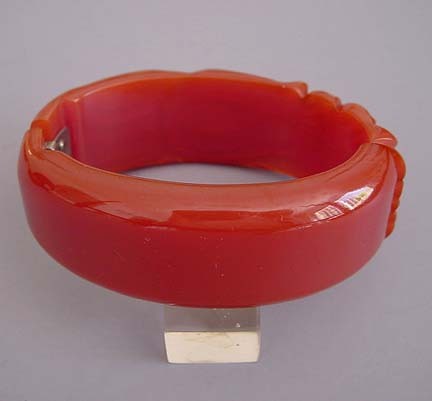 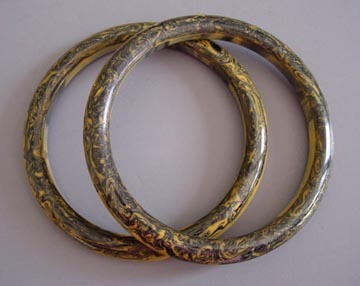 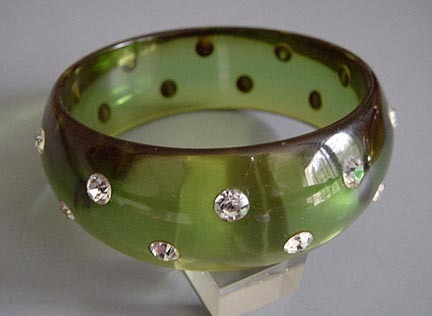 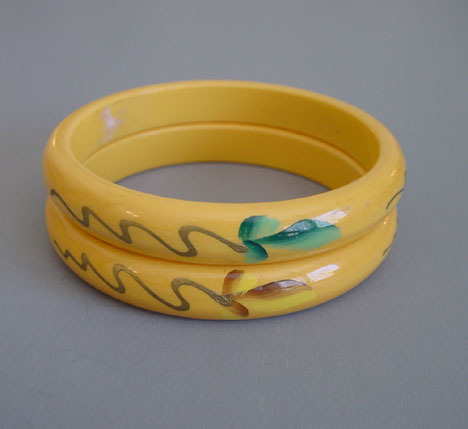 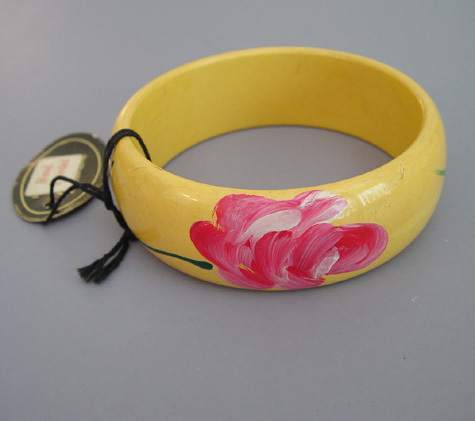 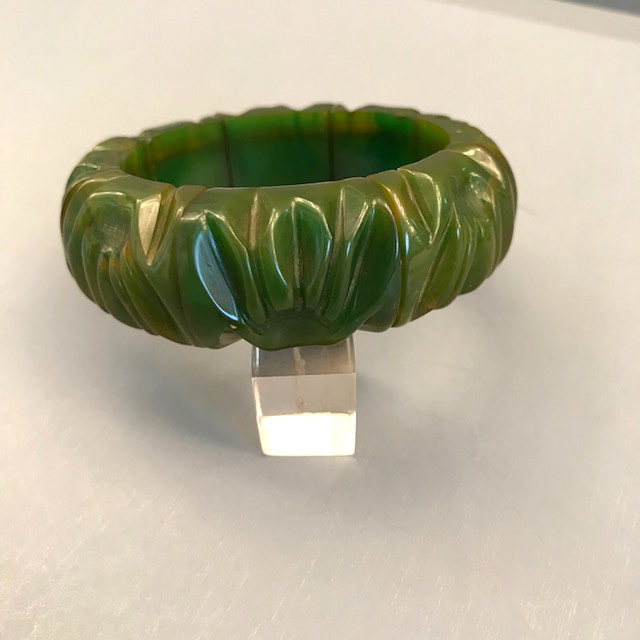 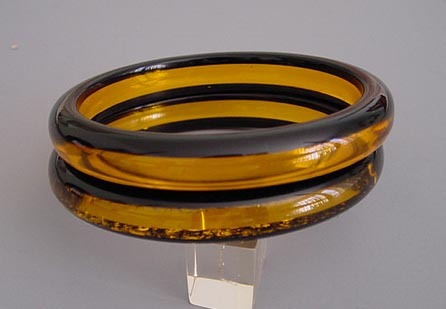 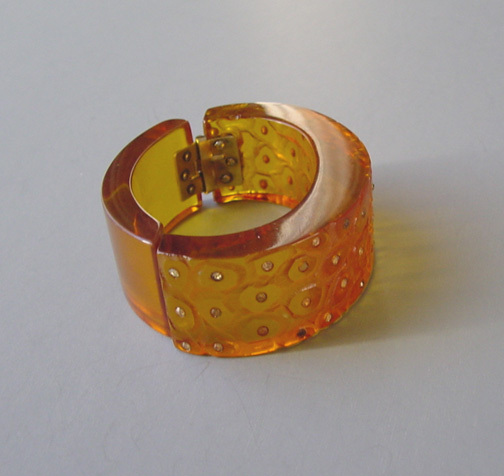 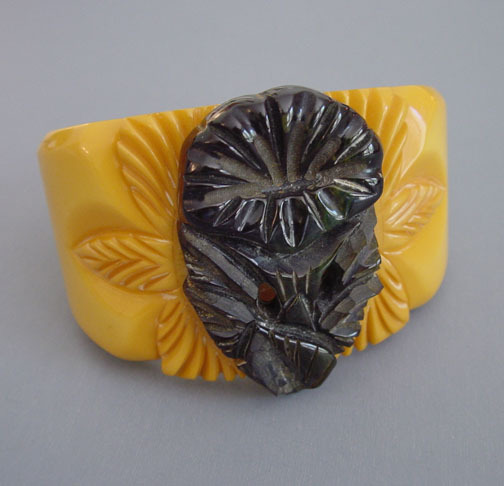 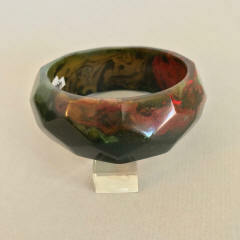 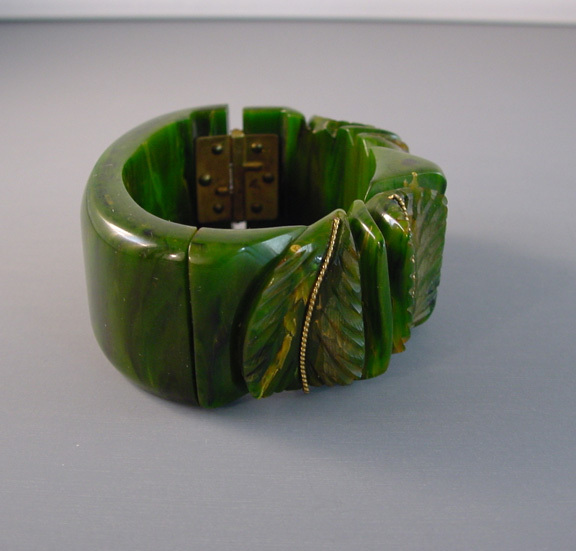 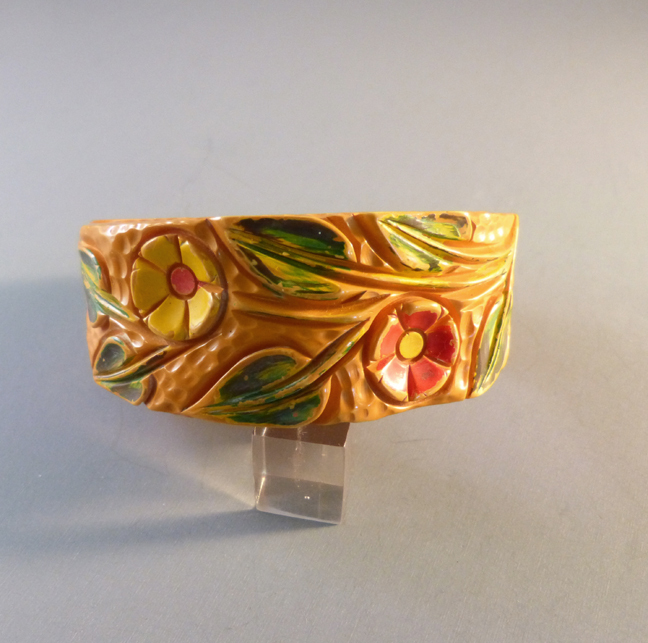 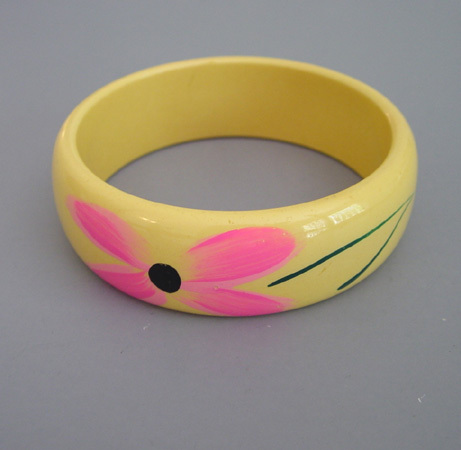 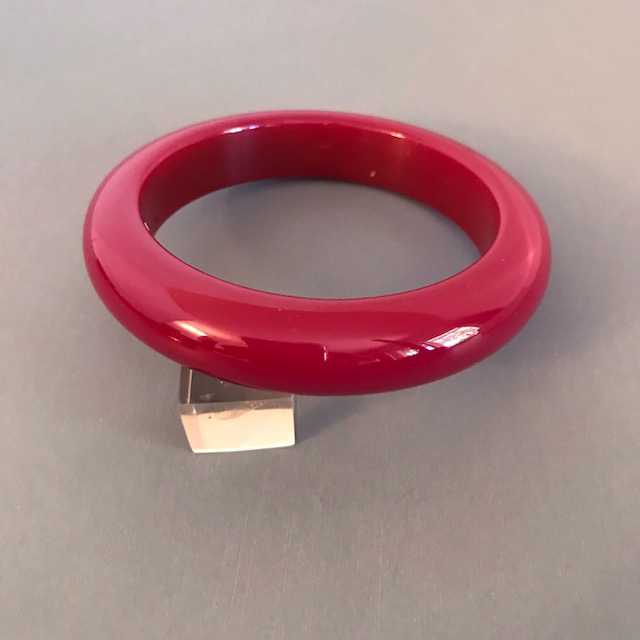 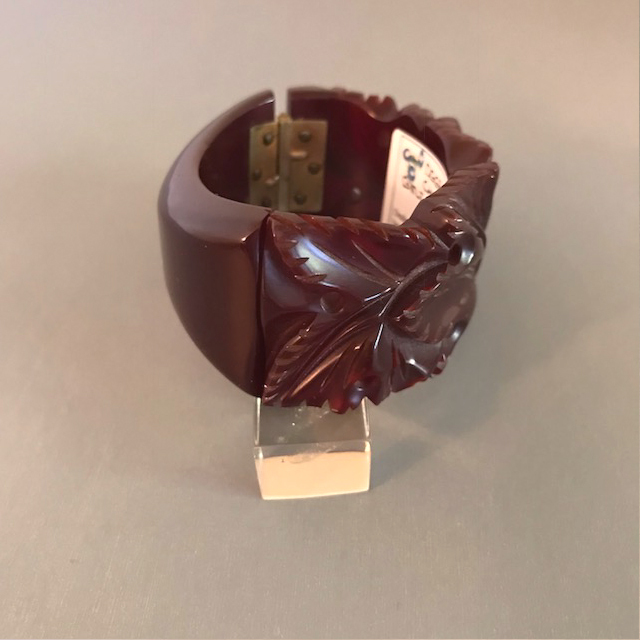 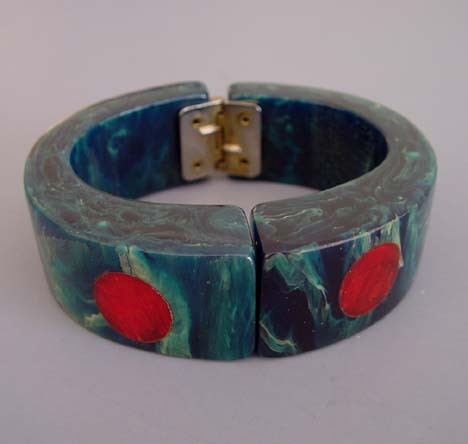 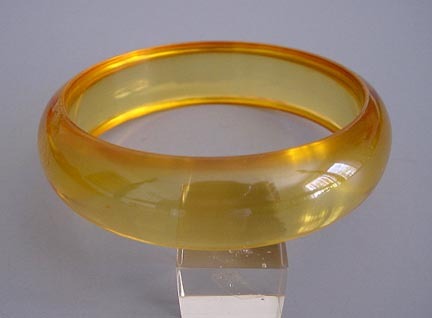 A bangle like this one but in black can be seen in the book "Bakelite jewelry, the Art of the Carver" by Deborah Lyons and Lyn Tortoriello on the page 32. 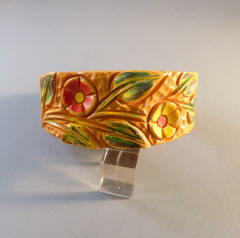 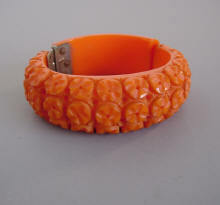 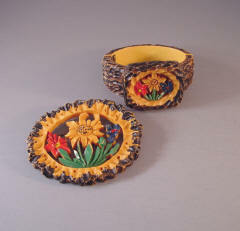 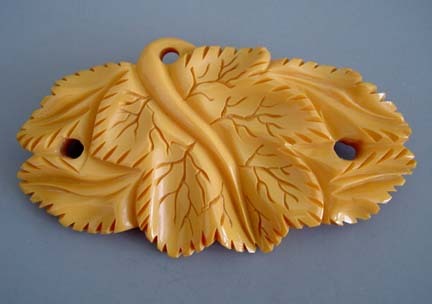 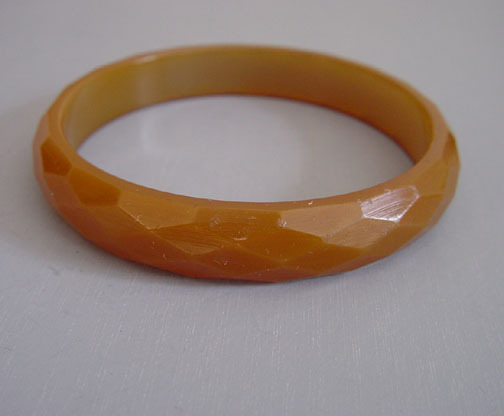 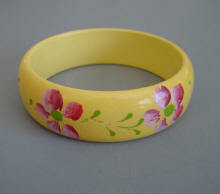 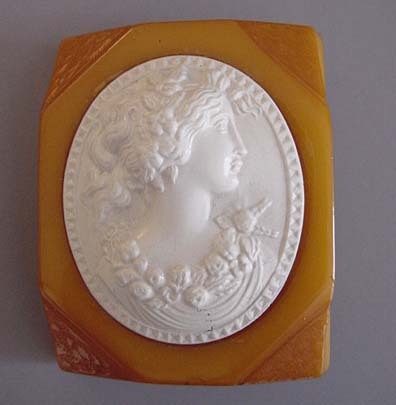 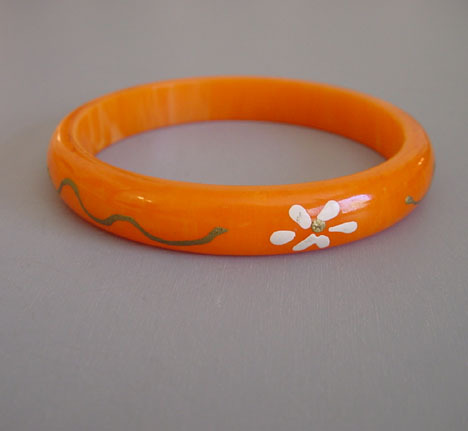 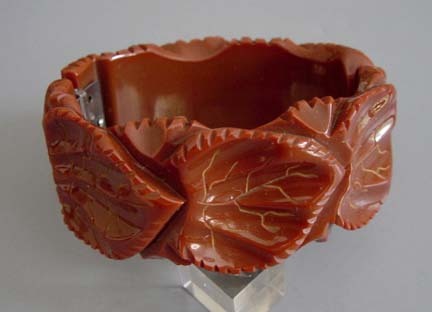 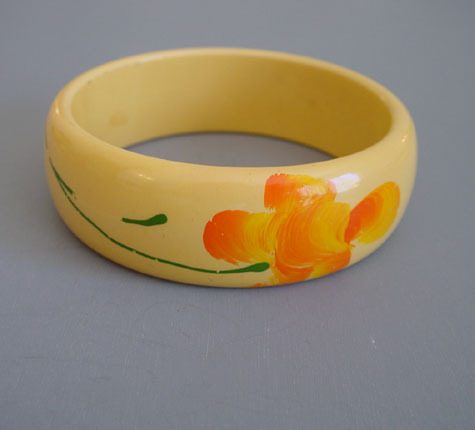 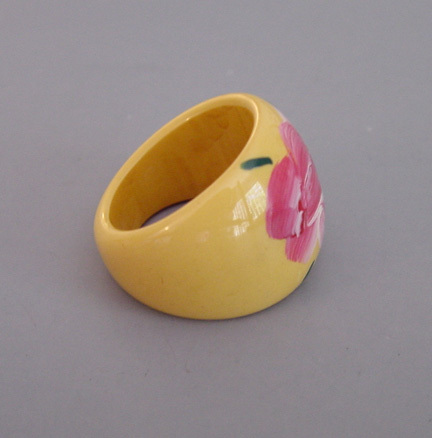 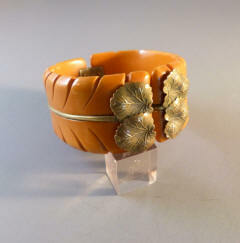 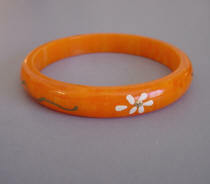 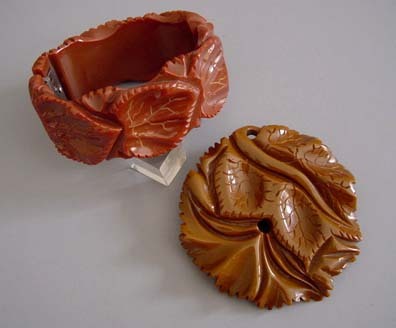 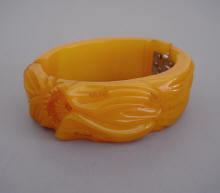 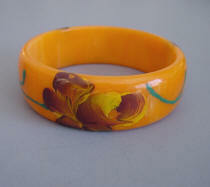 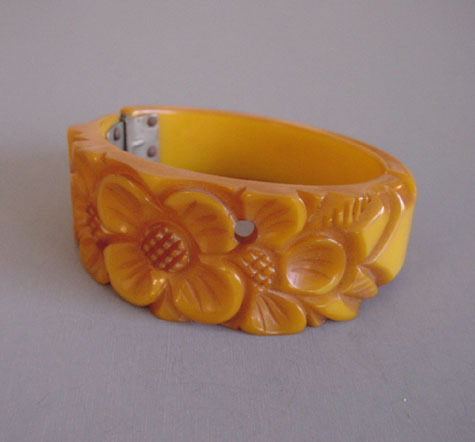 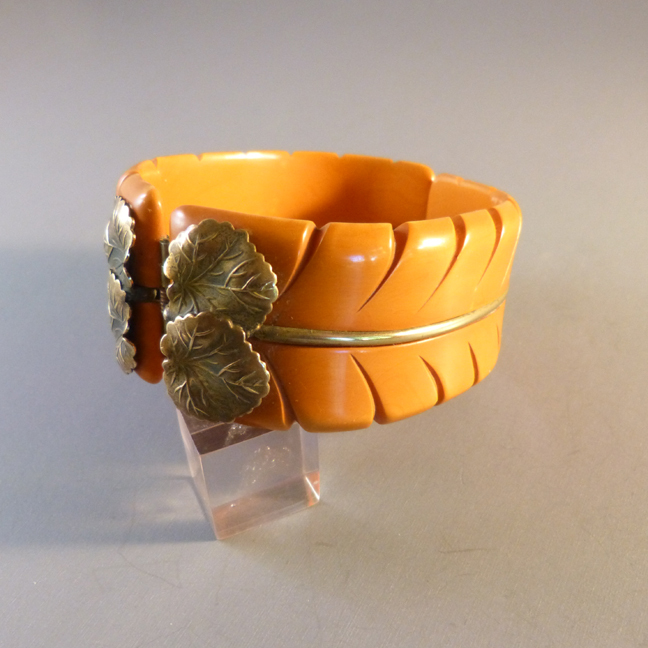 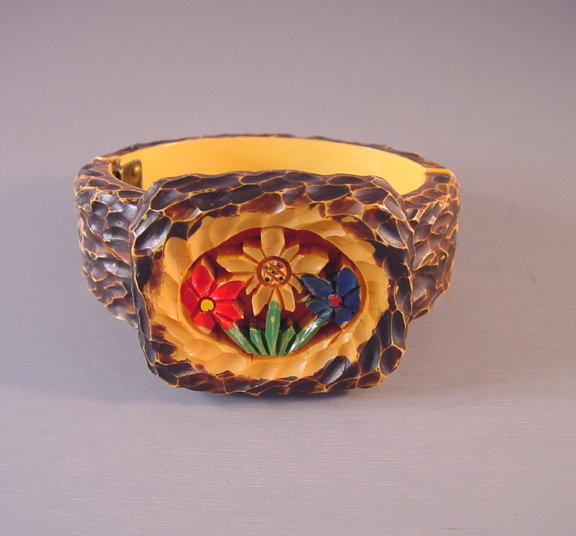 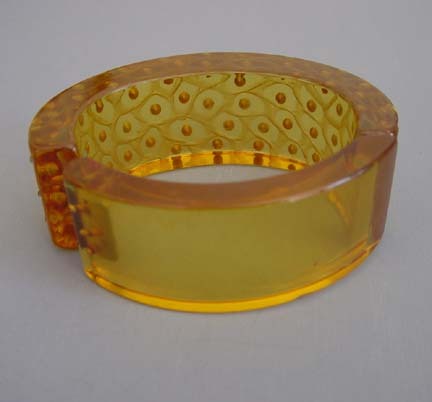 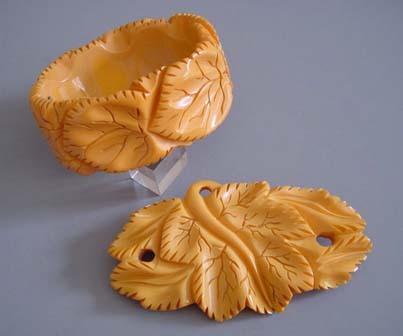 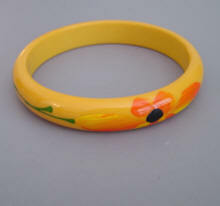 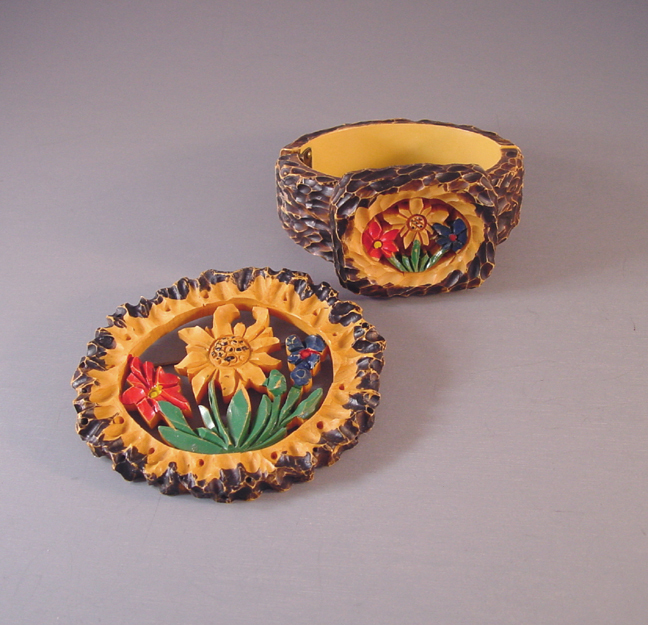 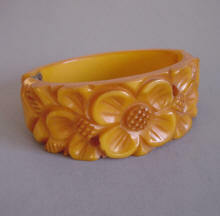 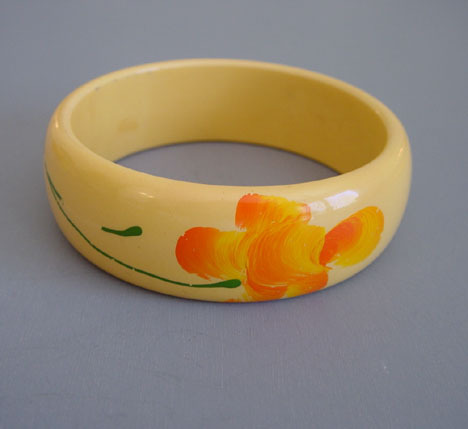 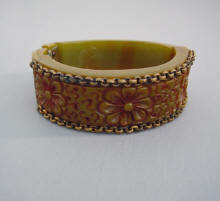 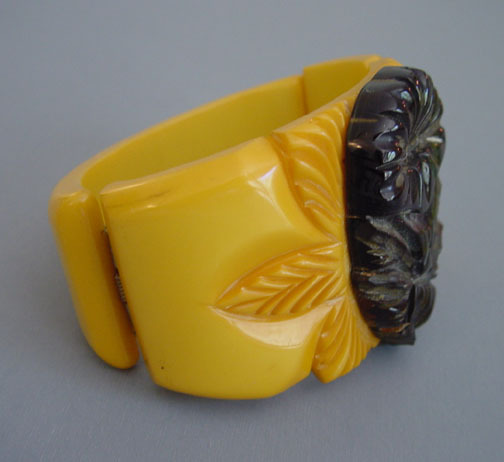 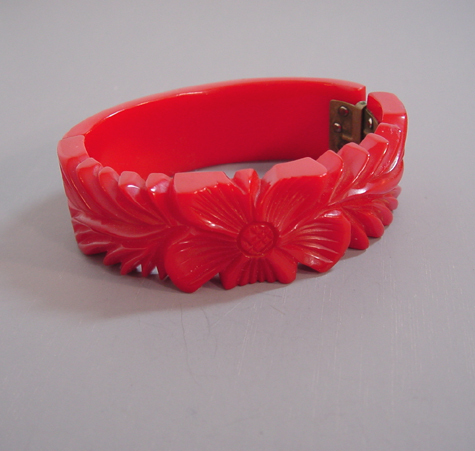 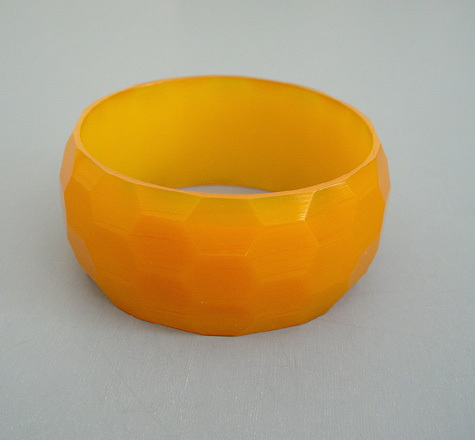 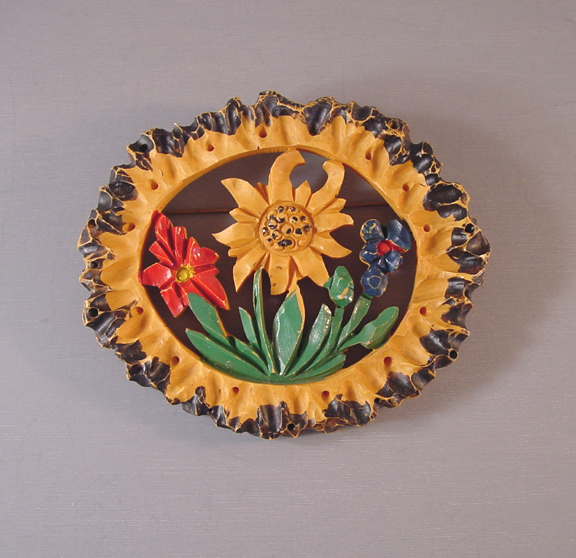 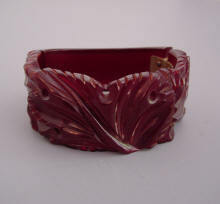 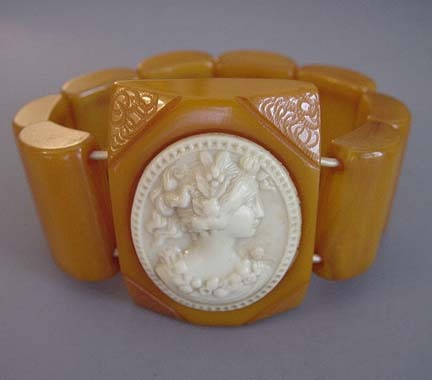 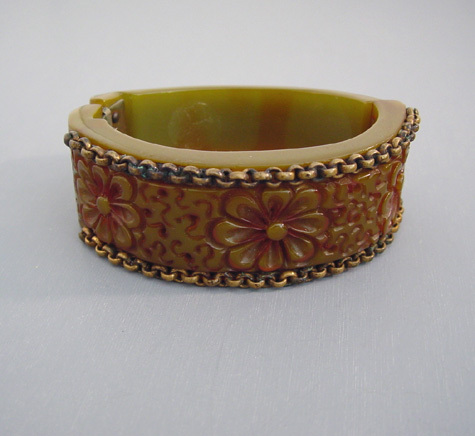 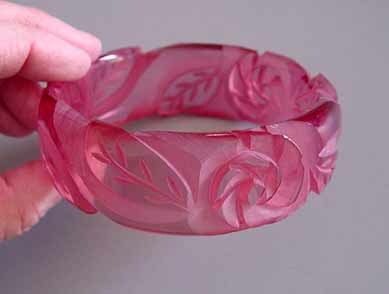 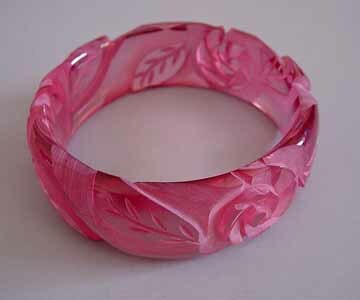 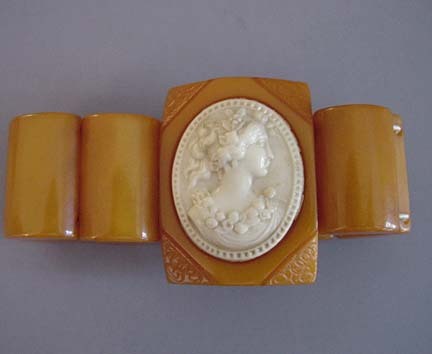 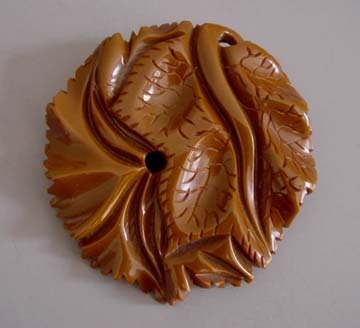 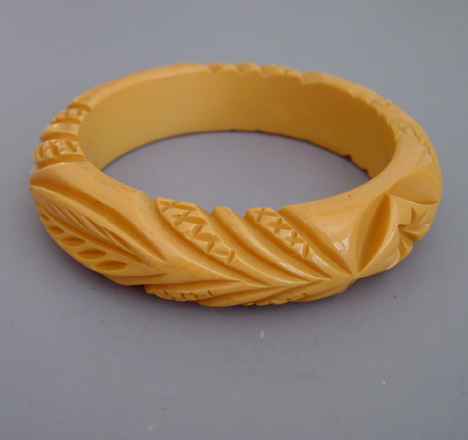 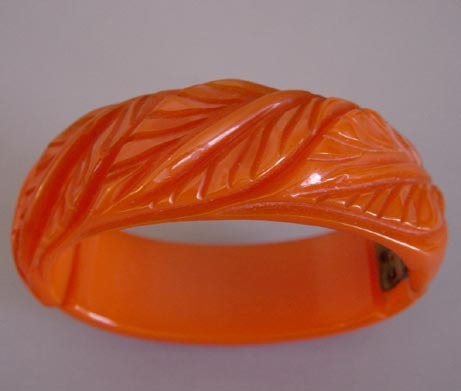 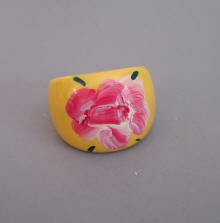 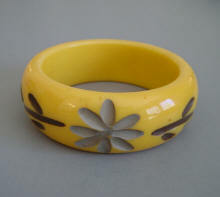 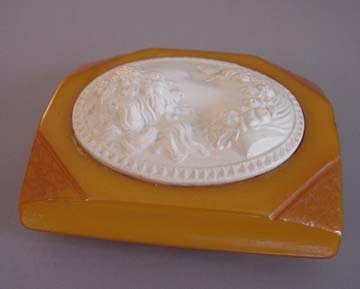 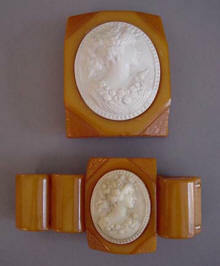 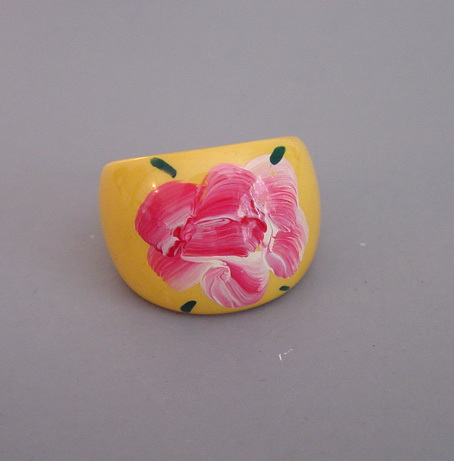 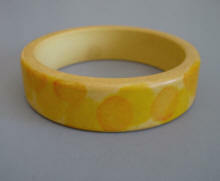 View #B13691 BAKELITE apricot translucent floral carved side hinged bangle, 6-1/2" by 1" by 1/3". 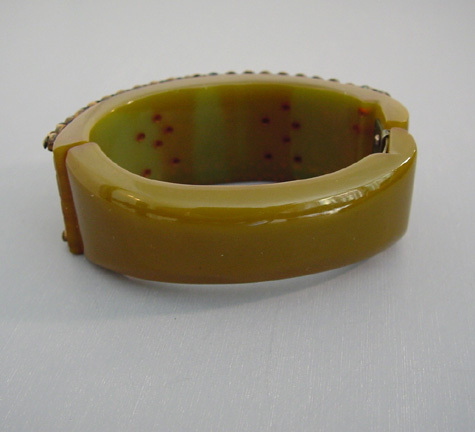 View View #B14004 BAKELITE stack. 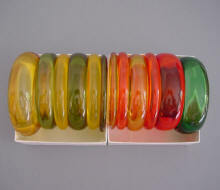 BAKELITE article in July 1985 issue of Connoisseur Magazine. 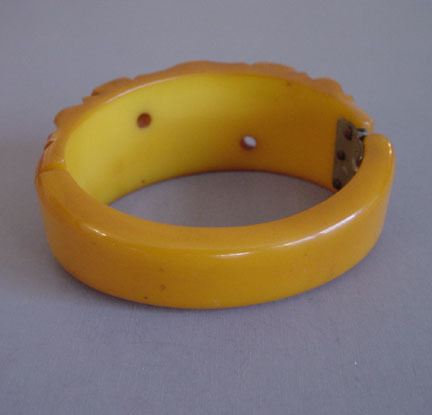 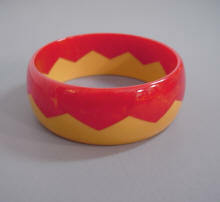 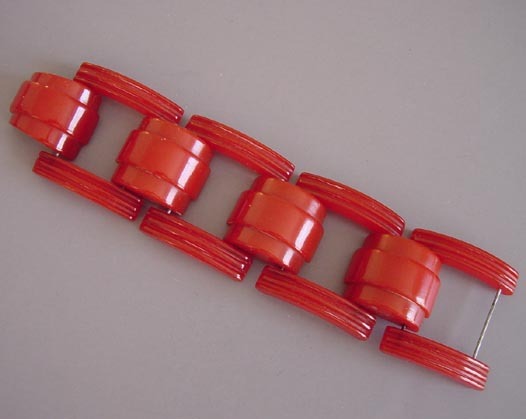 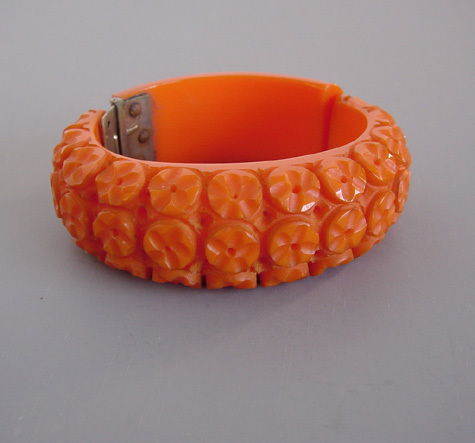 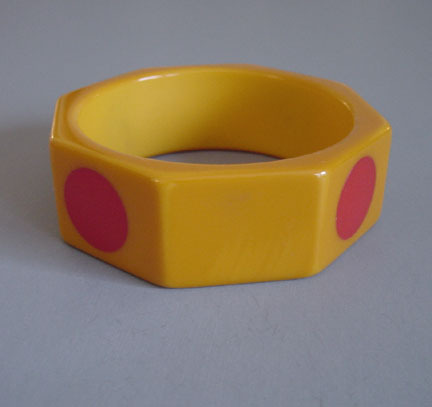 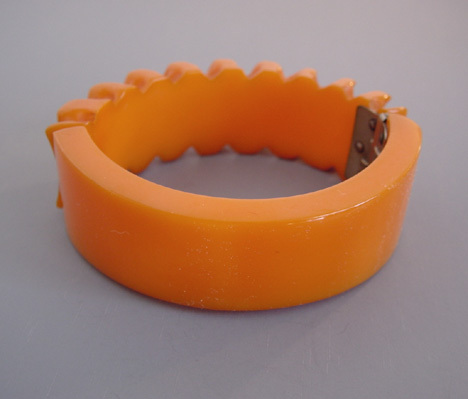 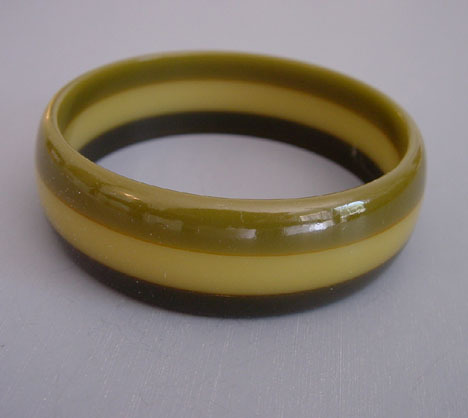 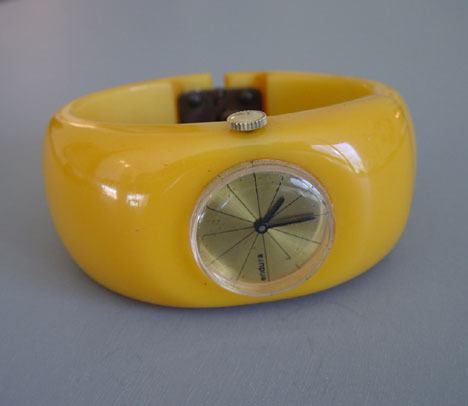 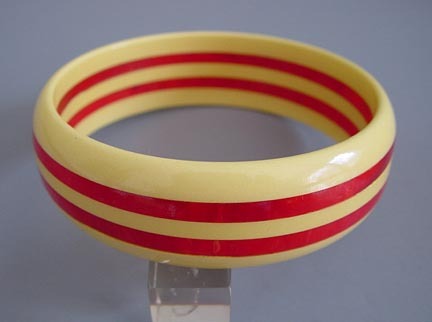 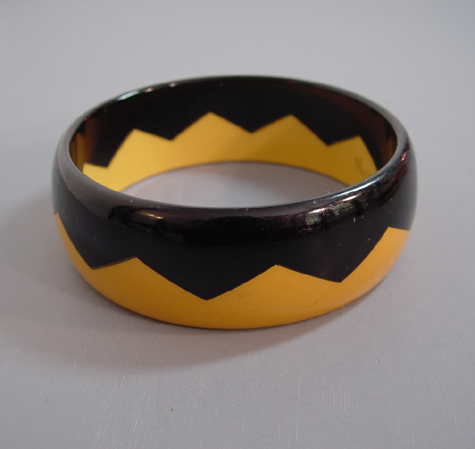 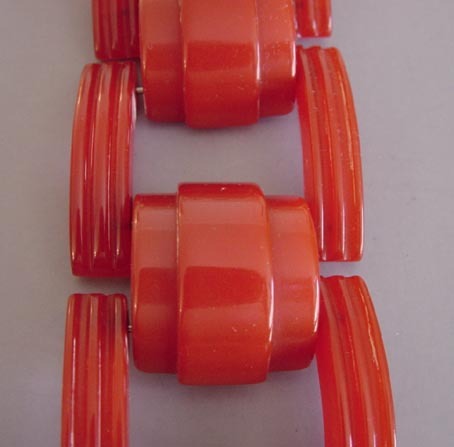 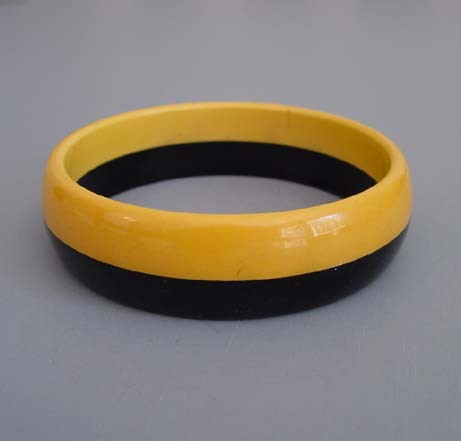 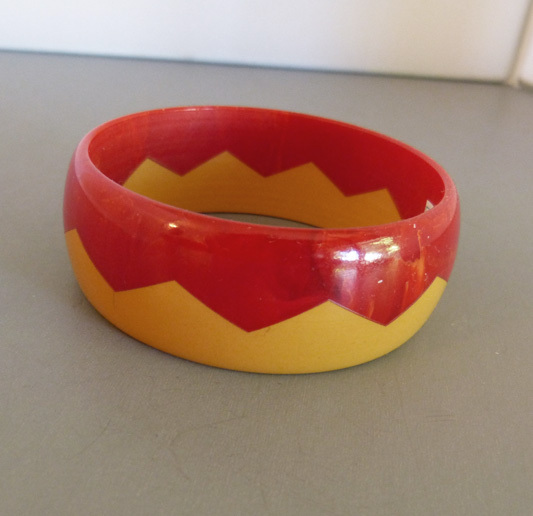 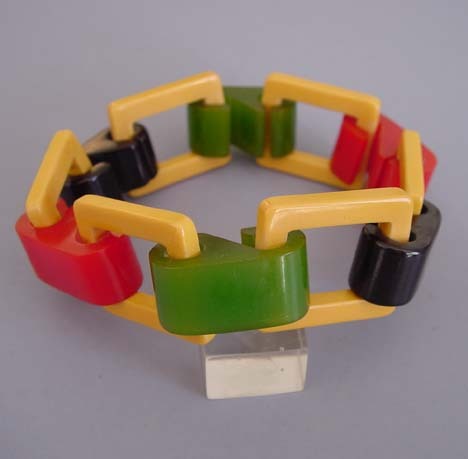 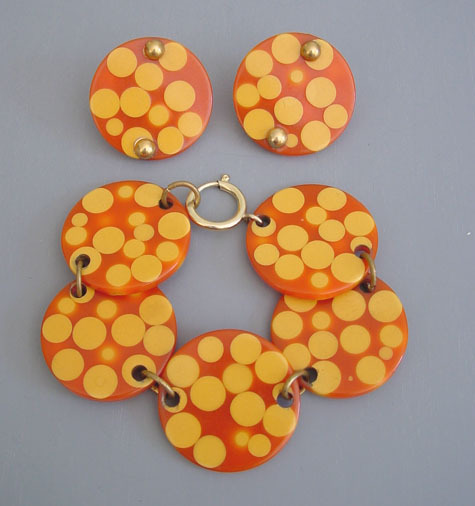 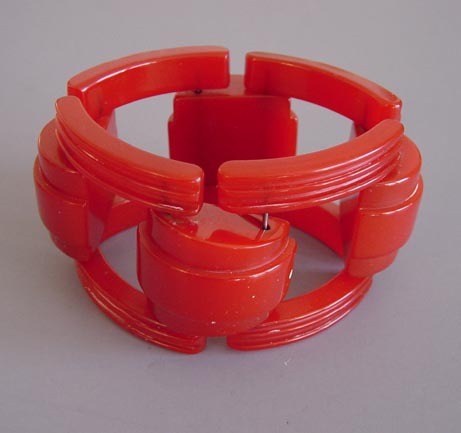 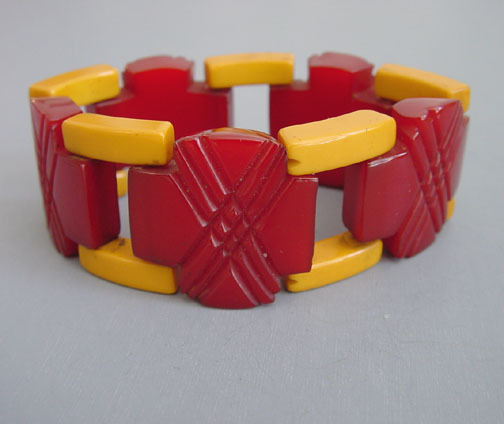 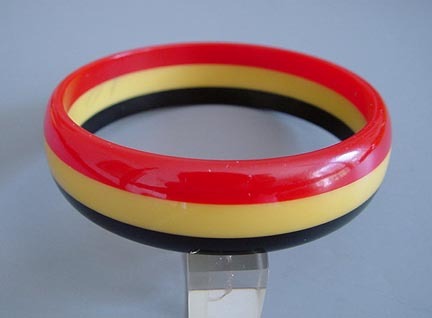 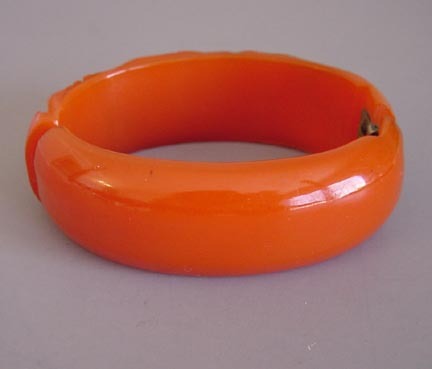 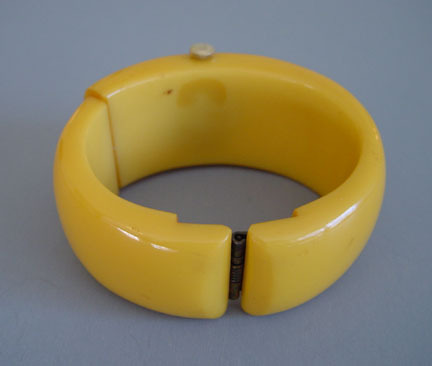 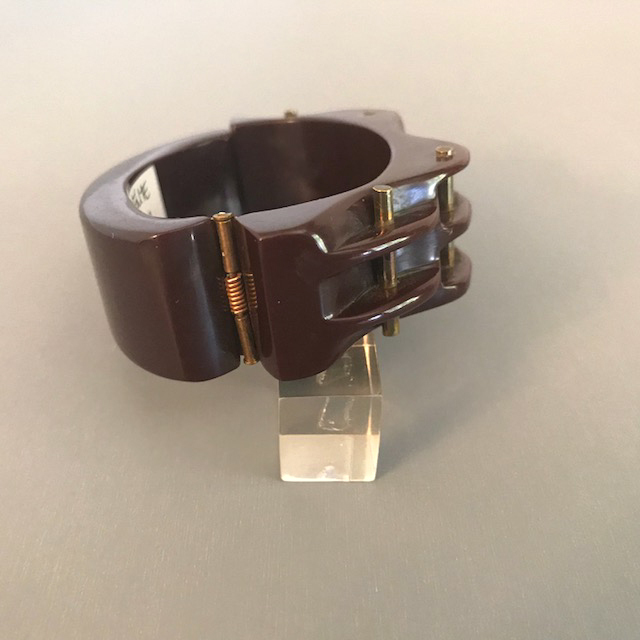 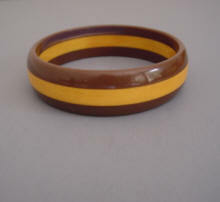 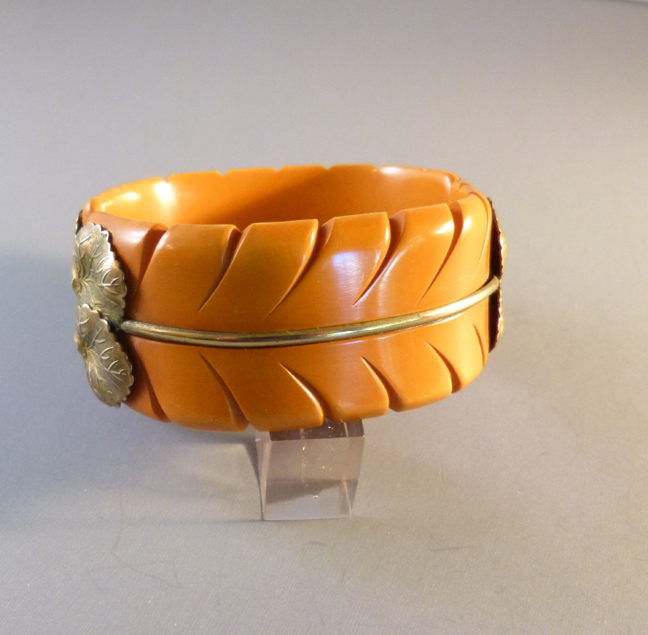 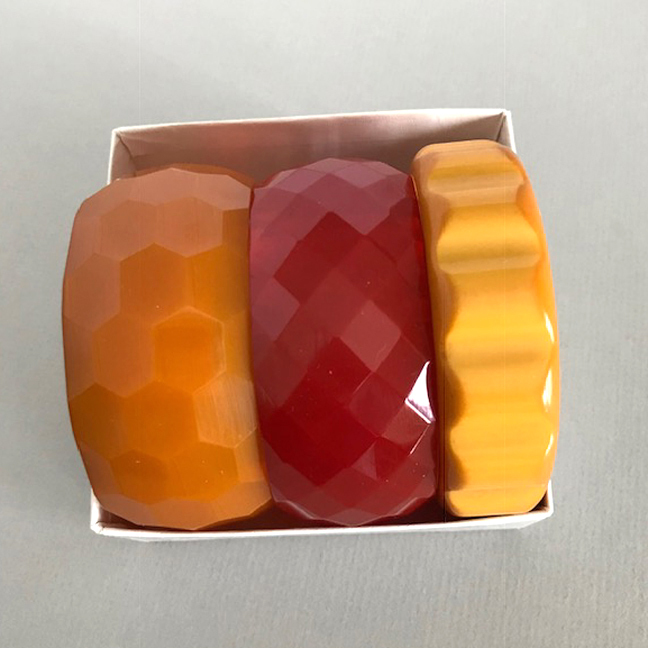 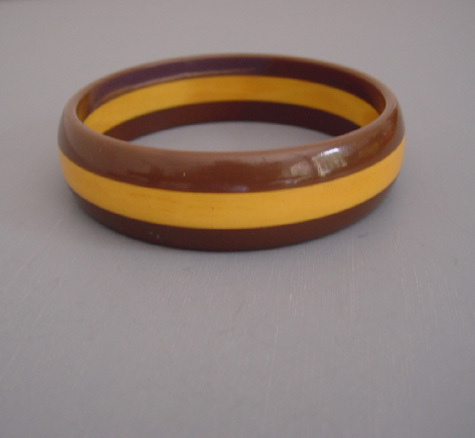 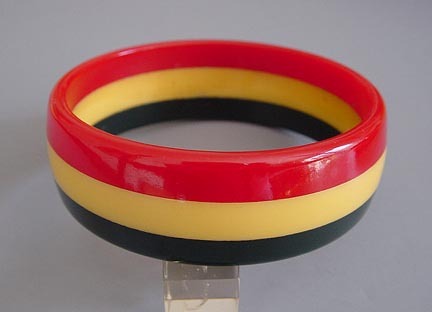 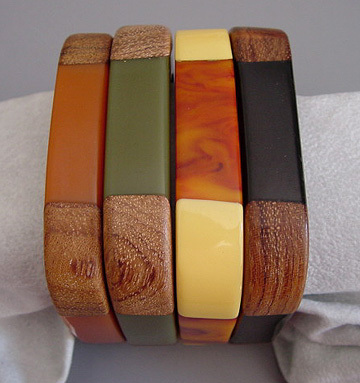 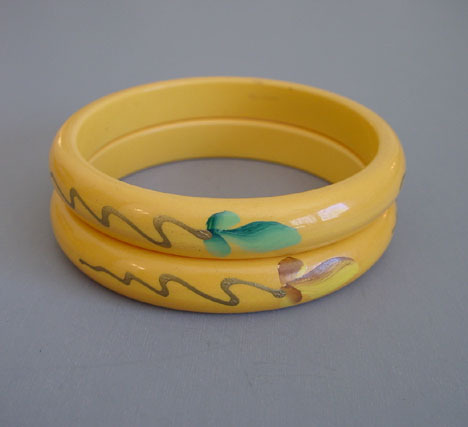 BAKELITE laminated bangles, circa 1940. 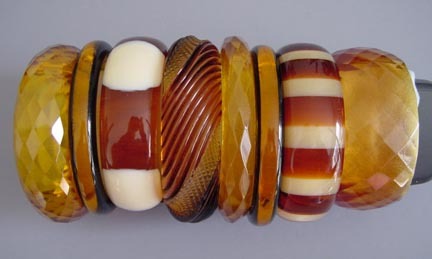 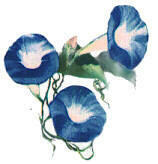 These were originally patriotic red, white and blue, and have oxidized over the years to these colors. 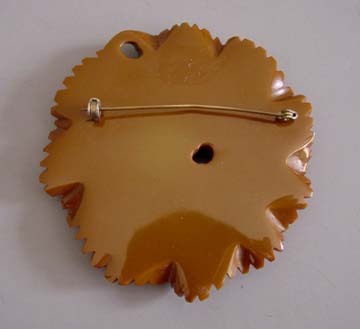 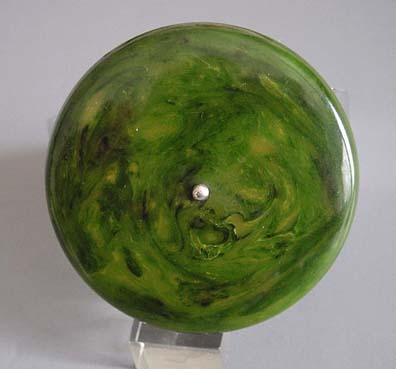 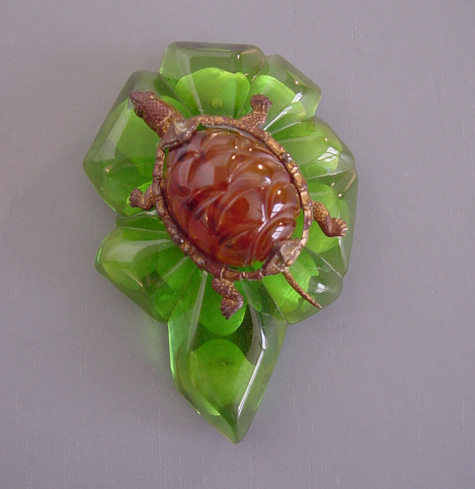 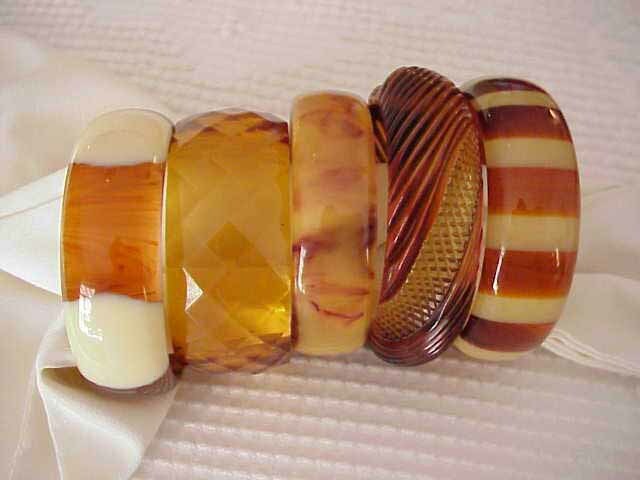 Laminated with special glue and then polished as one piece, bakelite could be combined colors, or laminated with wood or metal. 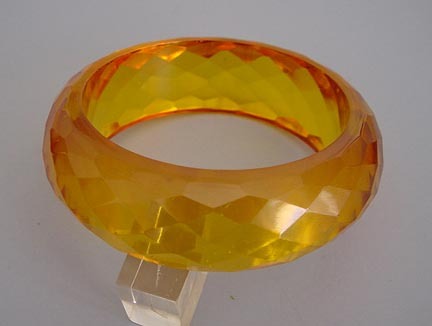 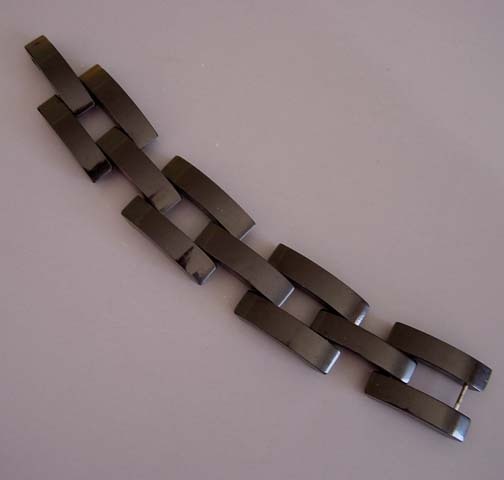 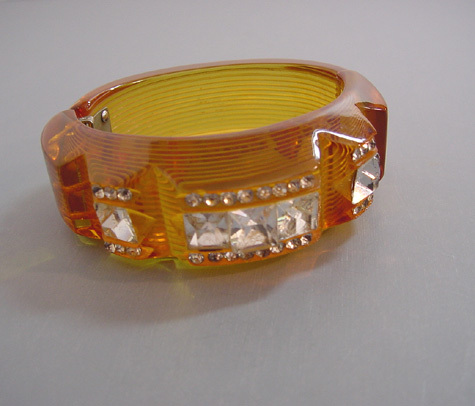 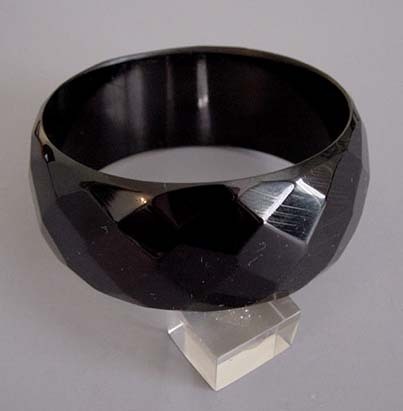 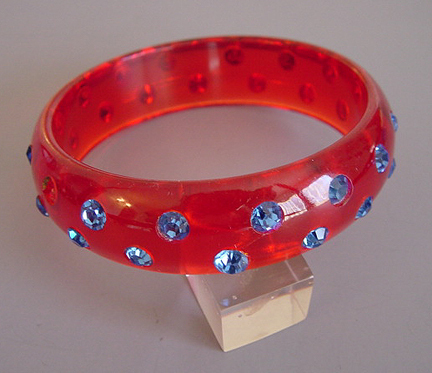 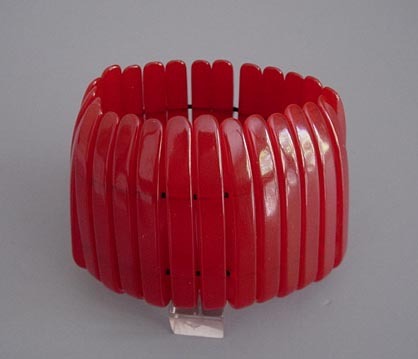 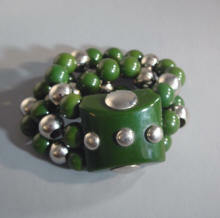 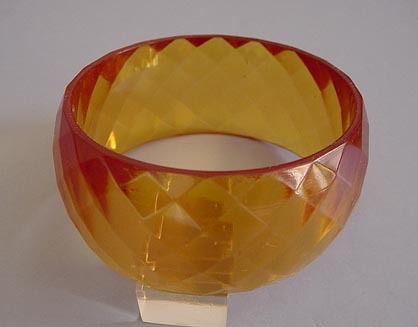 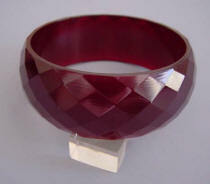 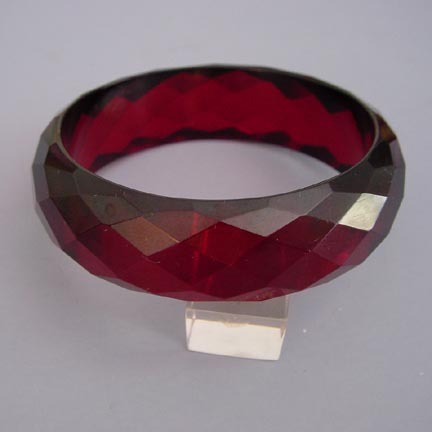 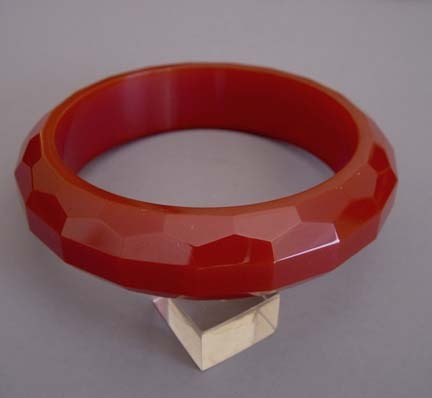 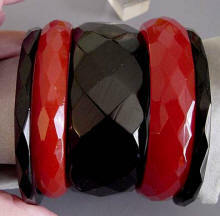 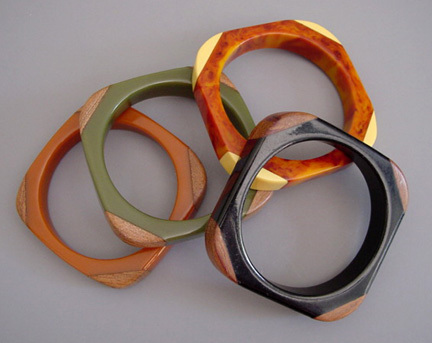 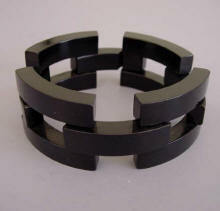 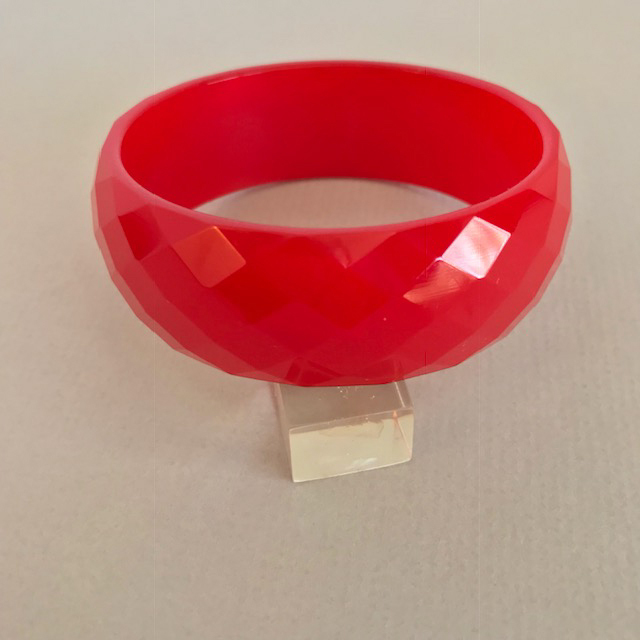 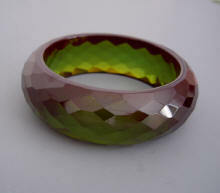 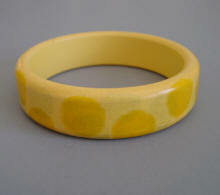 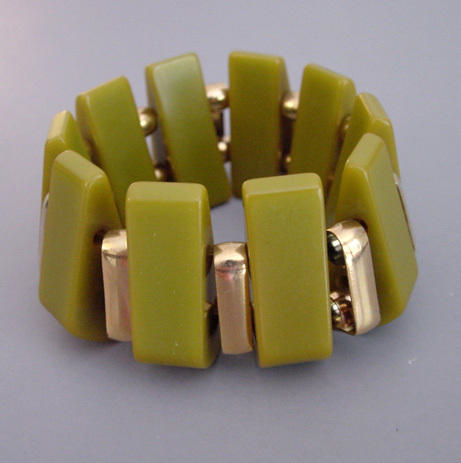 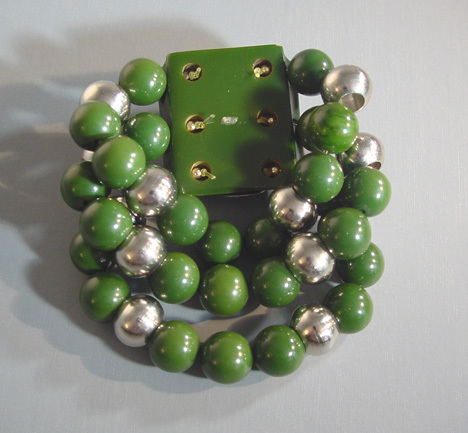 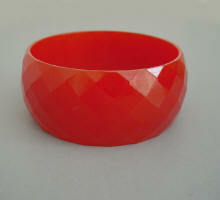 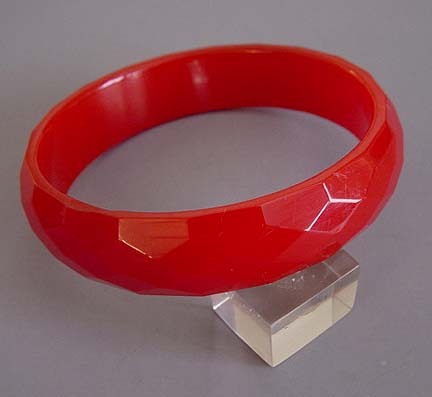 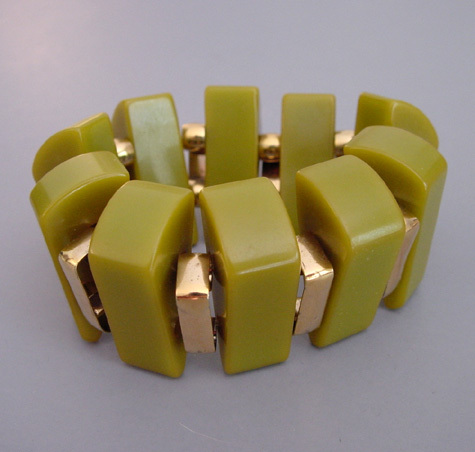 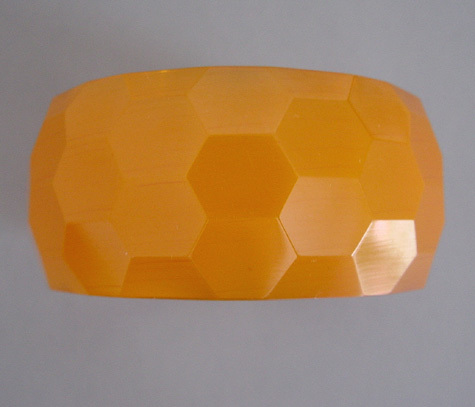 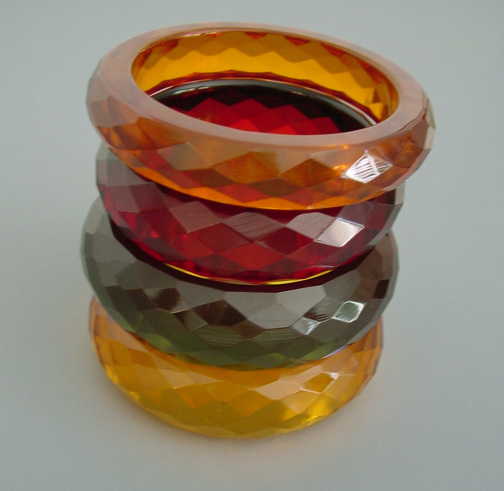 A group of faceted bangles is in the book "Collecting Art Plastic Jewelry" by Leigh Leshner on page 179. 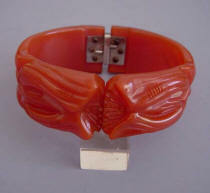 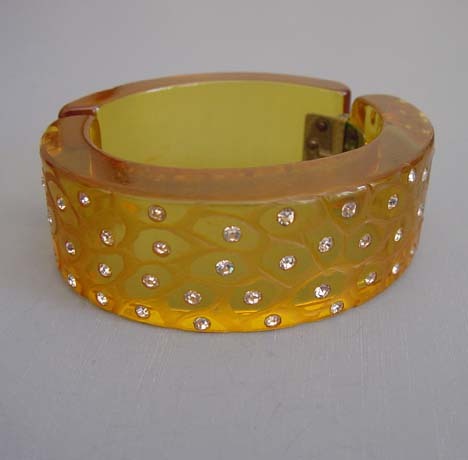 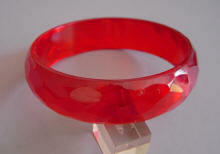 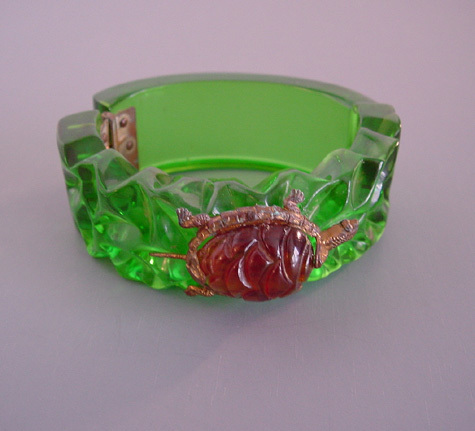 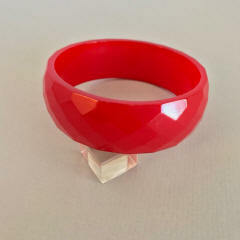 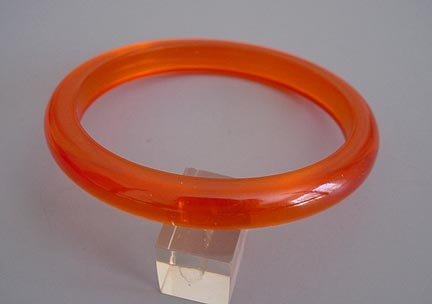 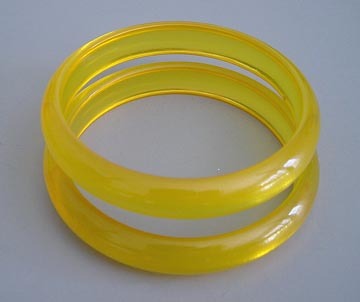 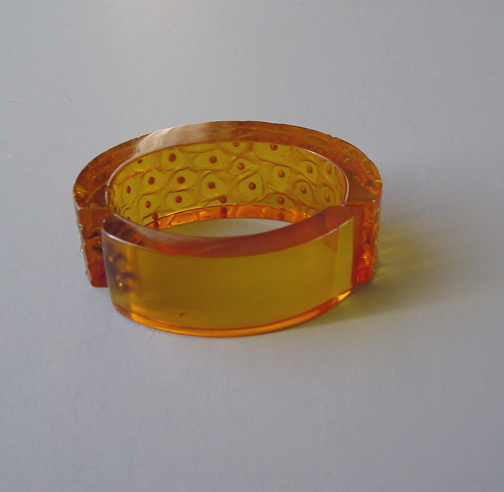 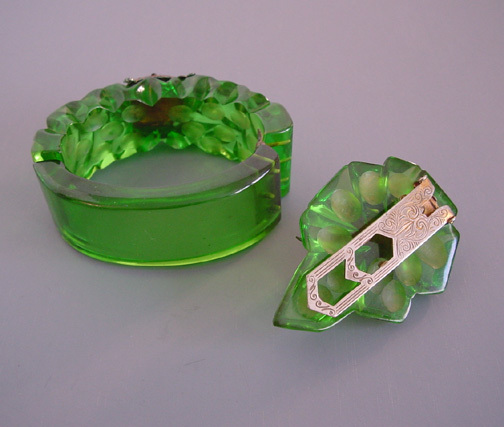 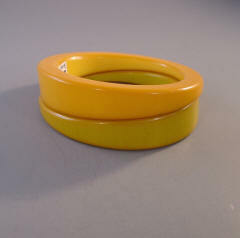 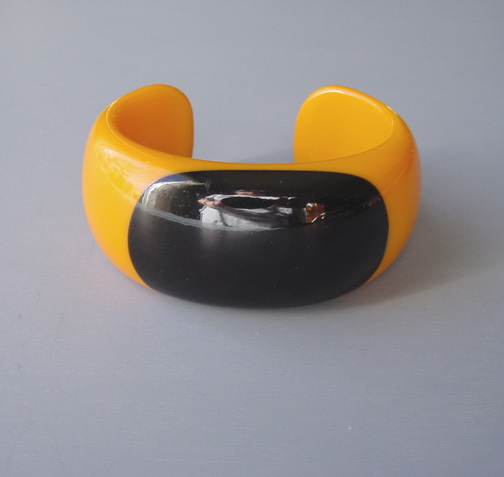 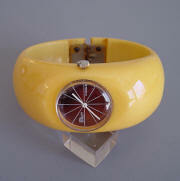 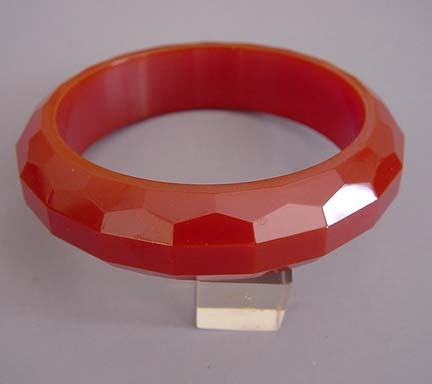 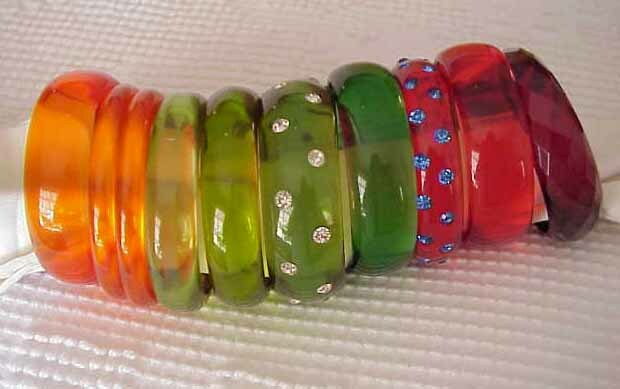 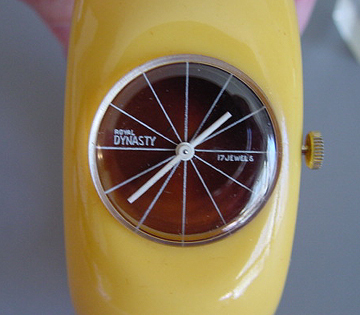 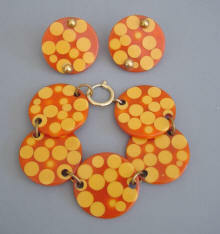 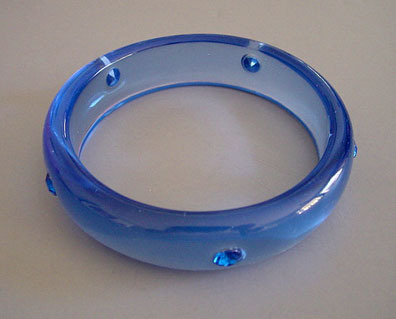 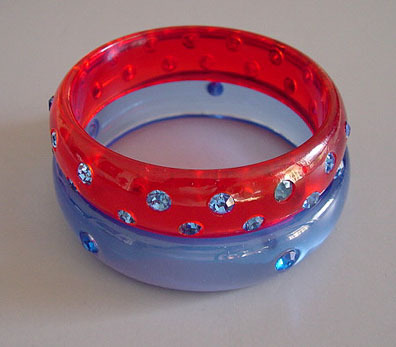 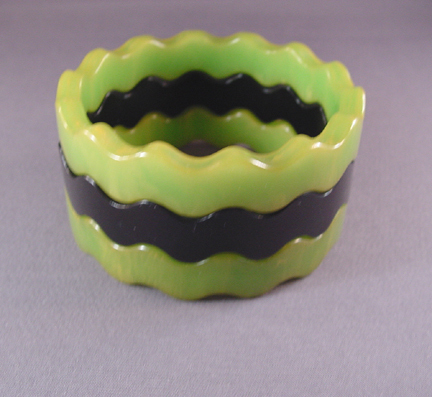 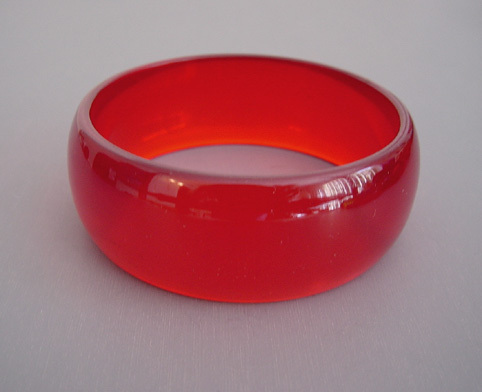 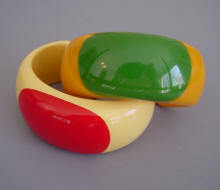 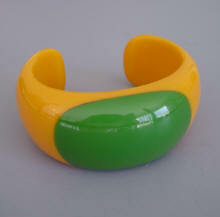 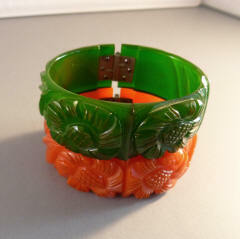 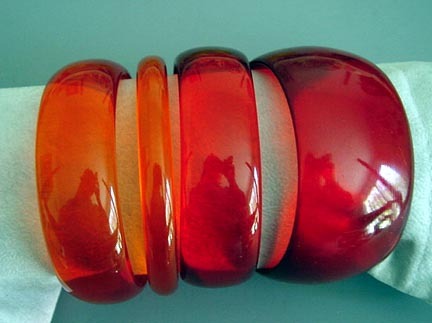 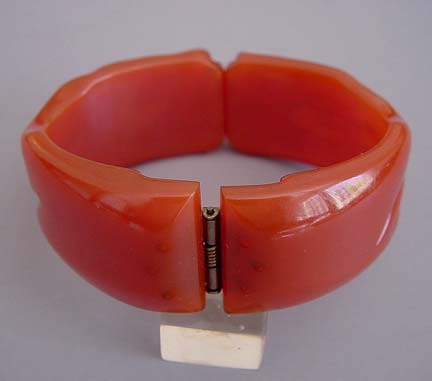 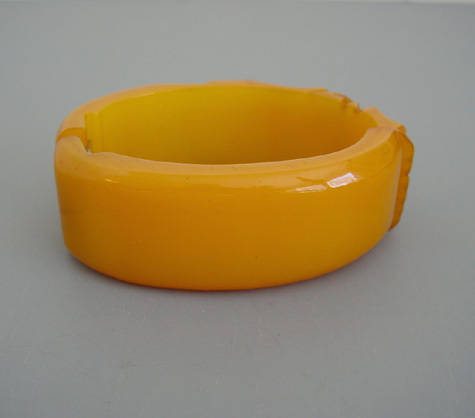 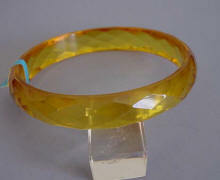 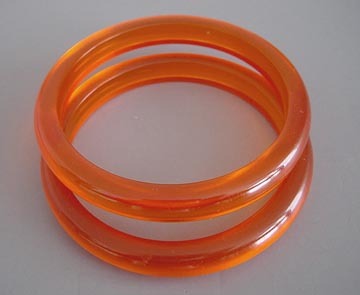 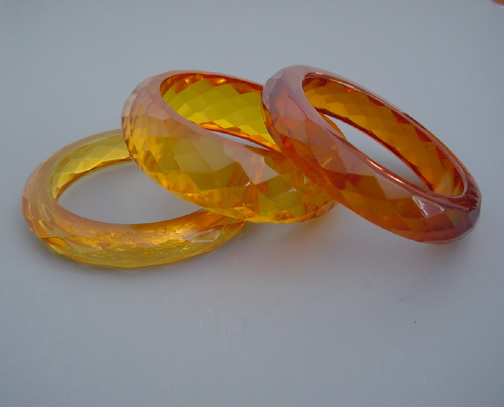 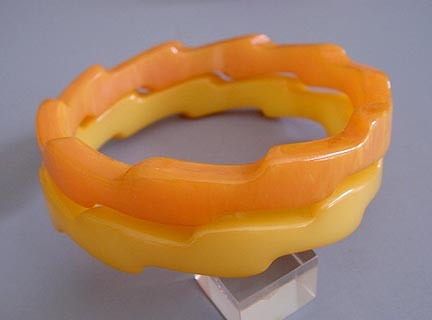 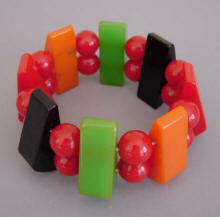 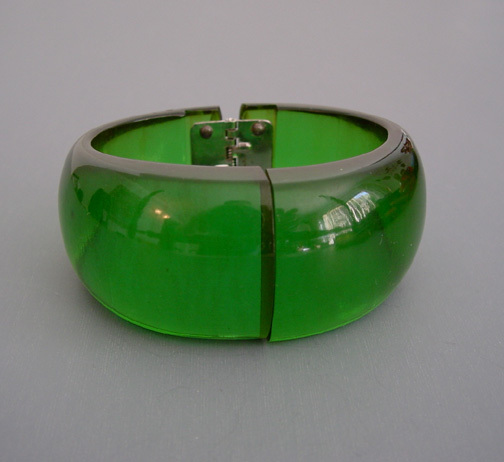 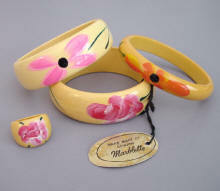 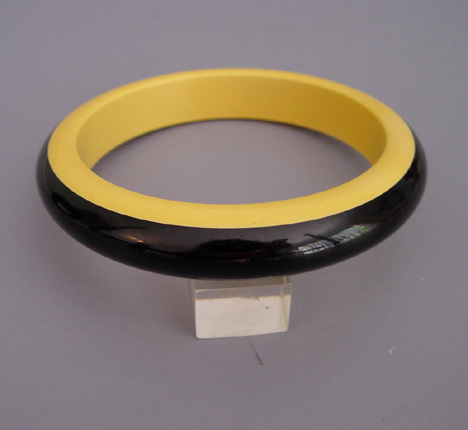 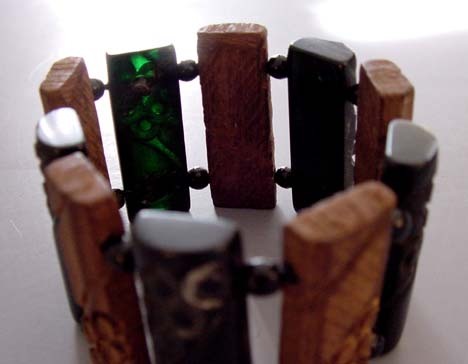 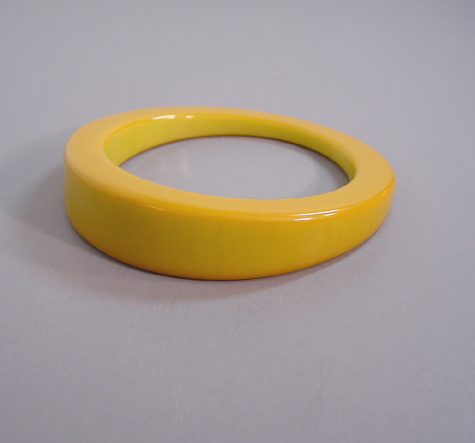 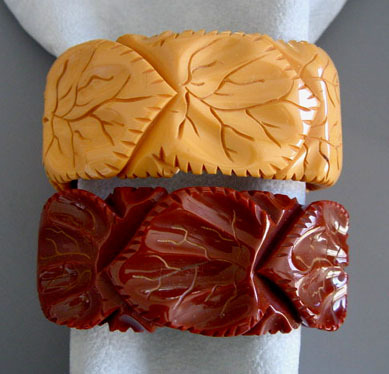 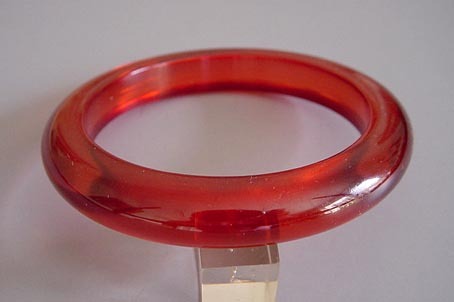 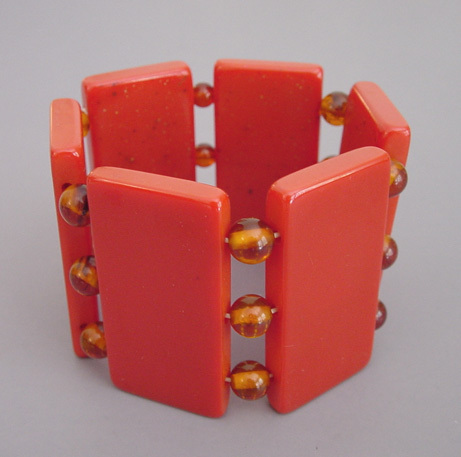 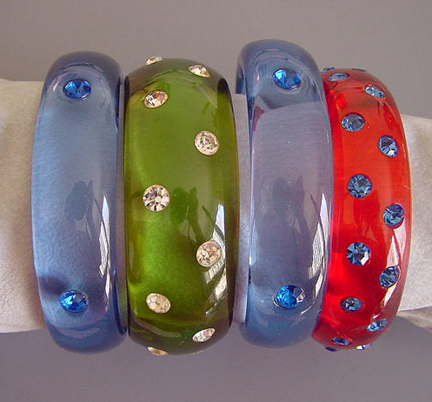 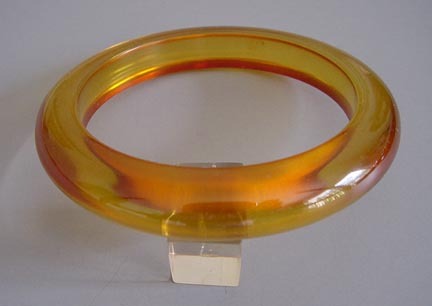 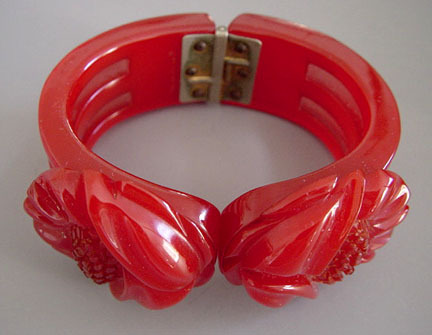 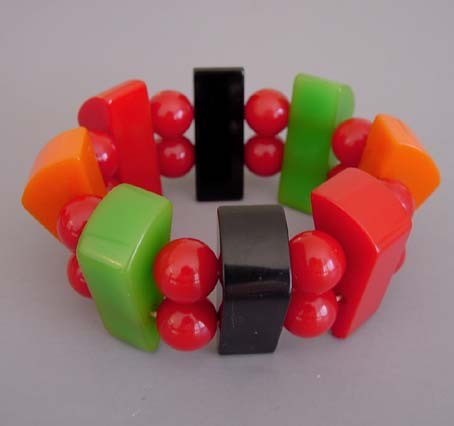 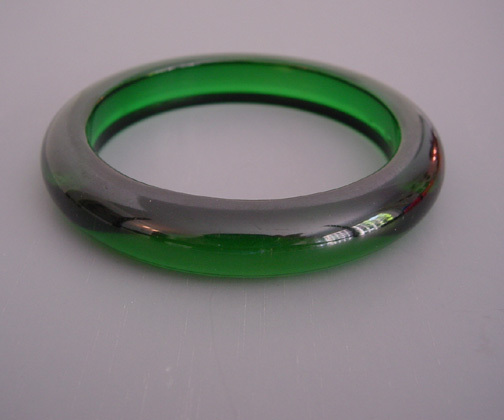 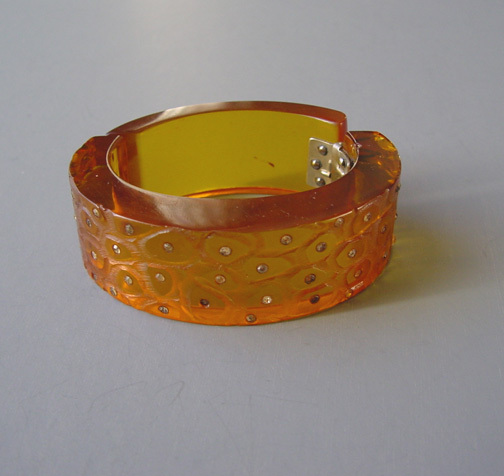 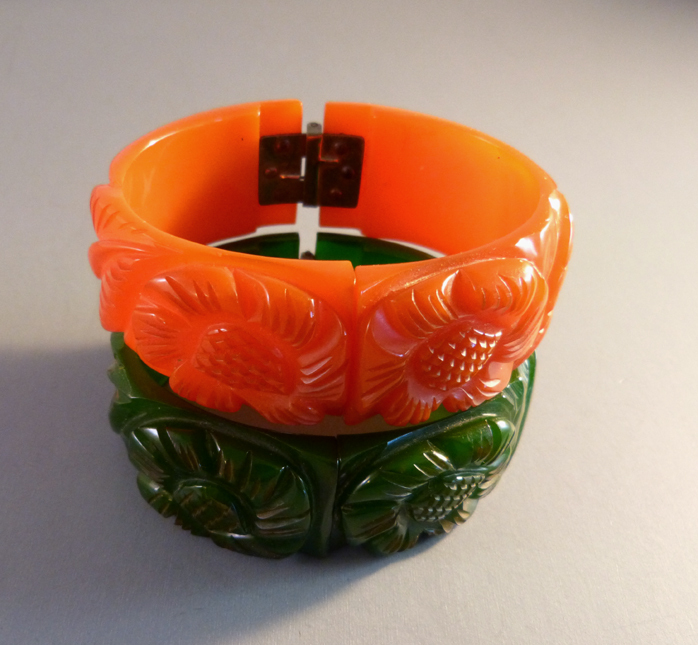 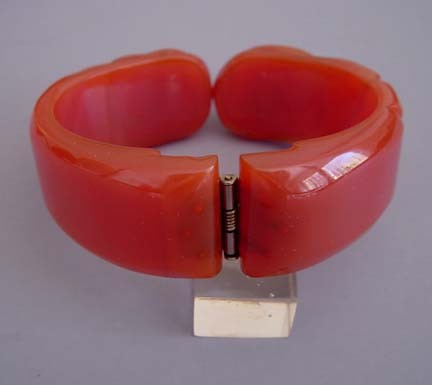 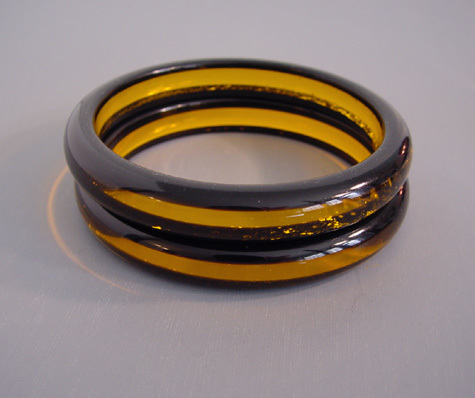 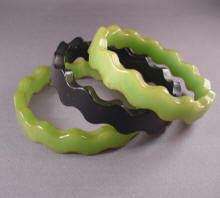 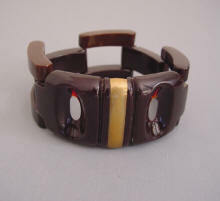 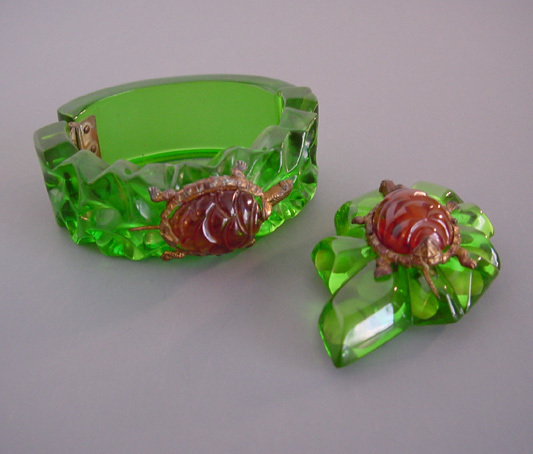 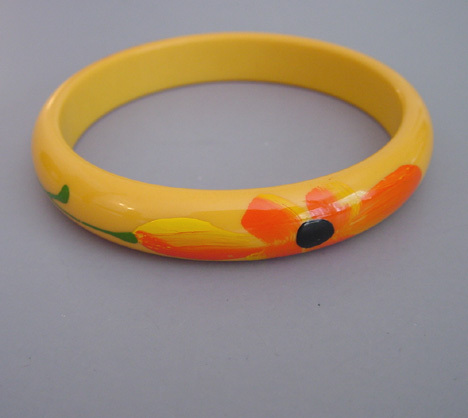 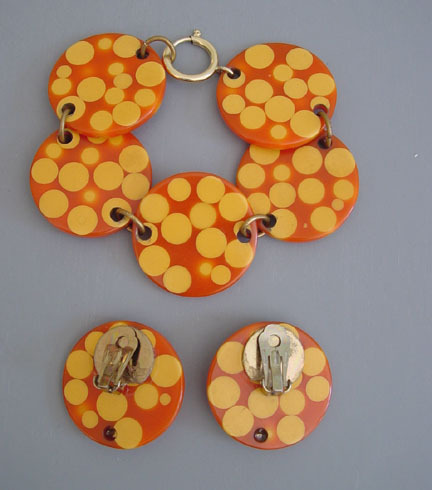 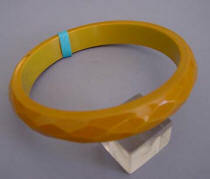 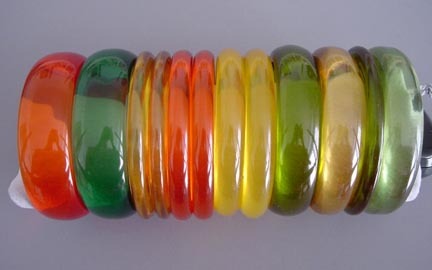 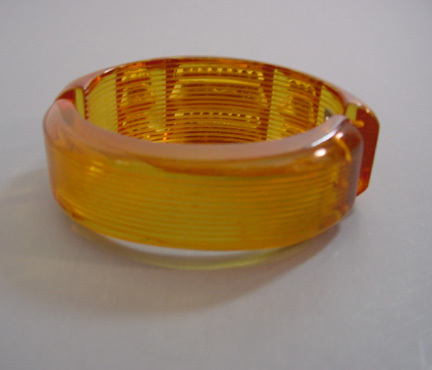 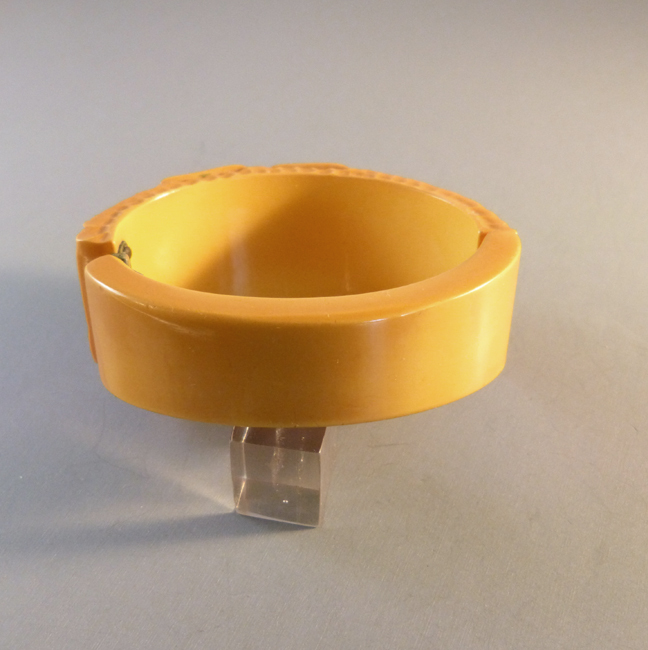 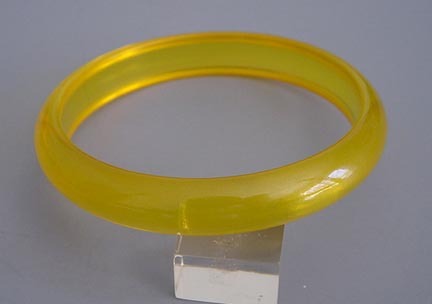 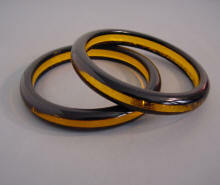 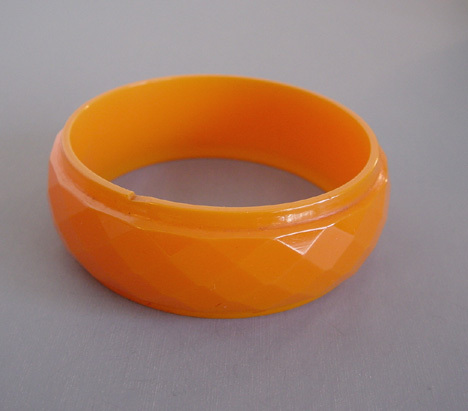 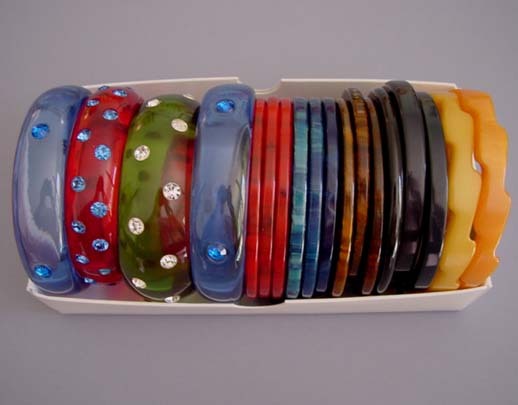 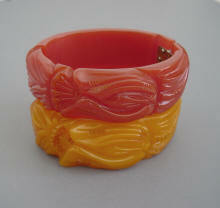 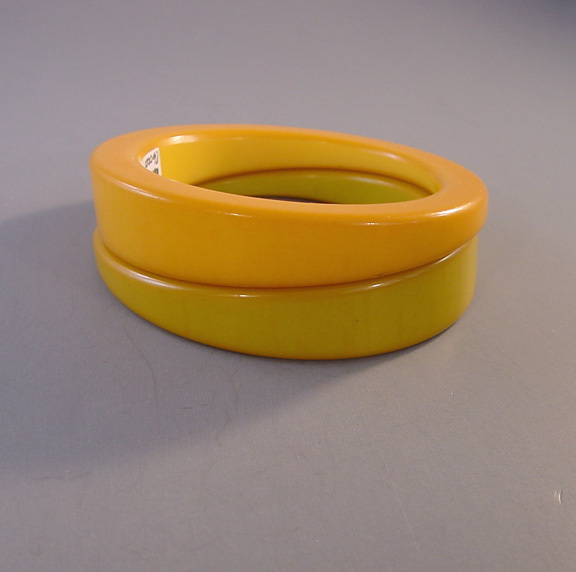 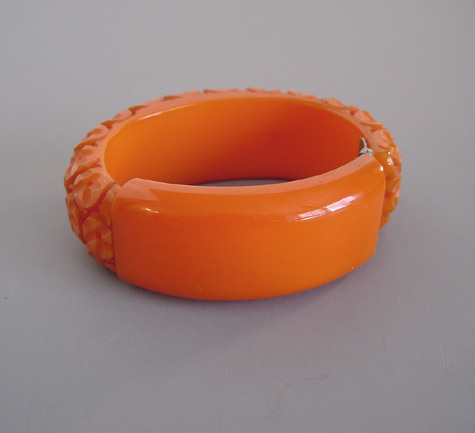 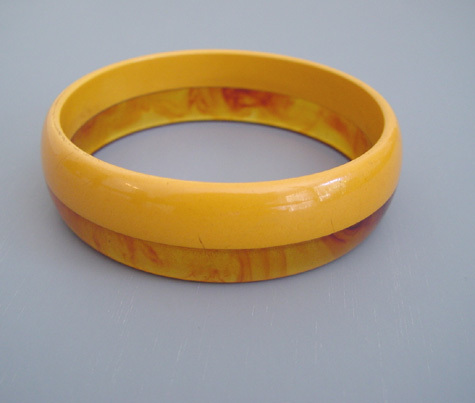 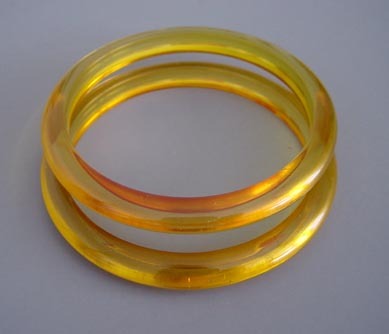 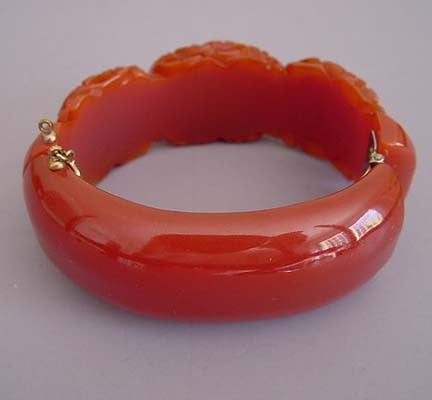 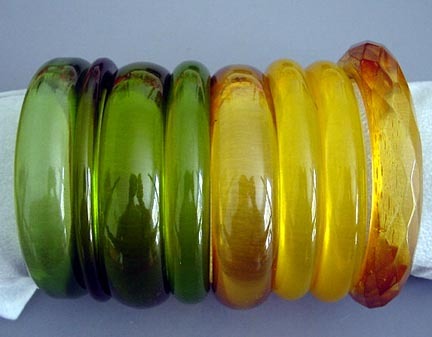 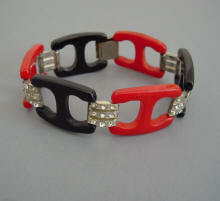 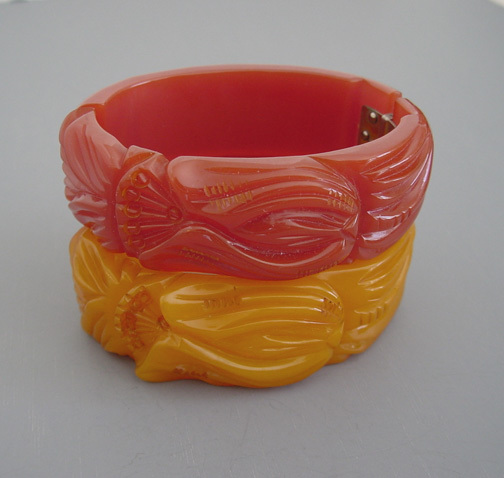 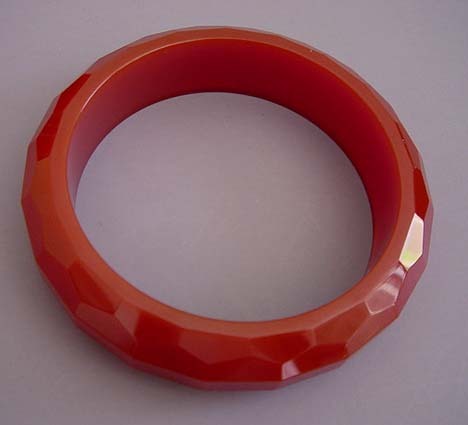 BAKELITE Prystal and transparent bangle collection. 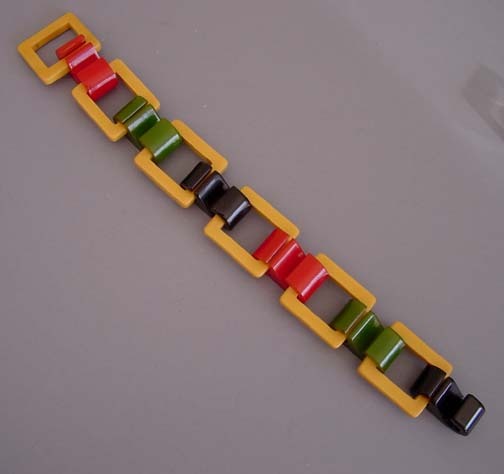 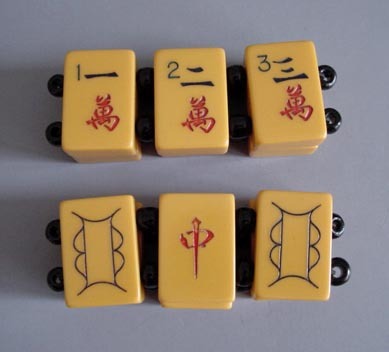 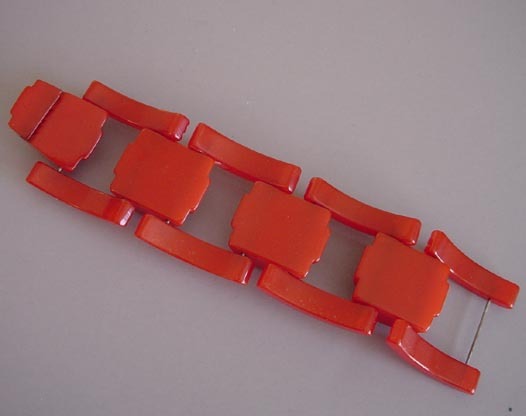 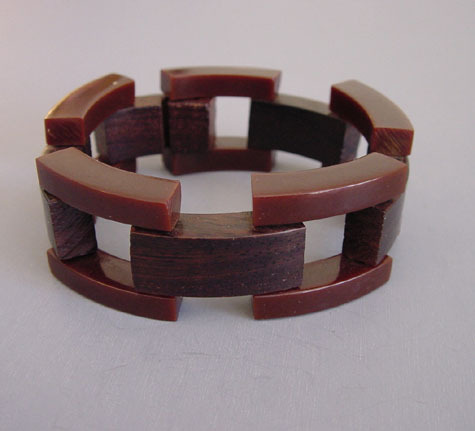 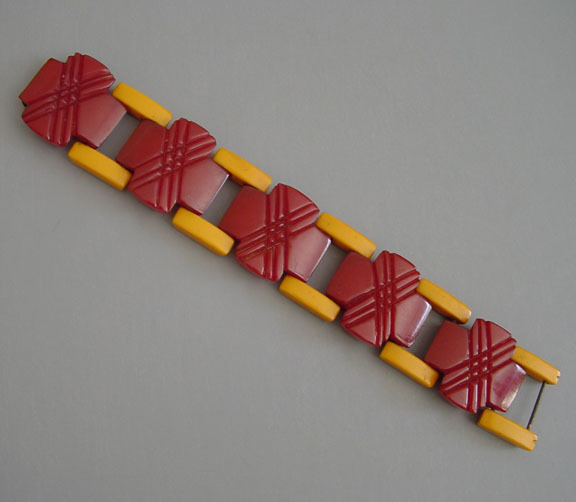 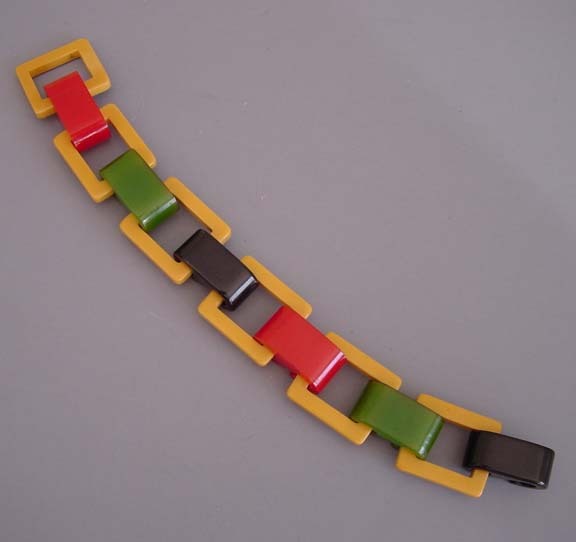 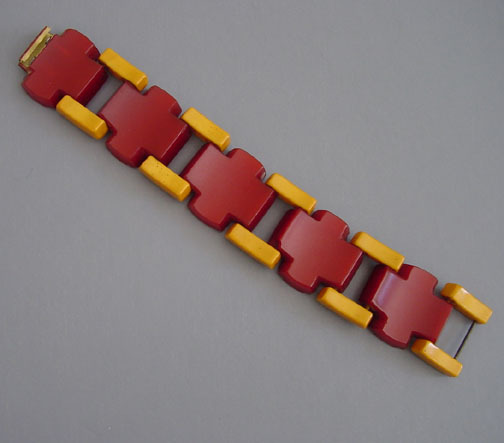 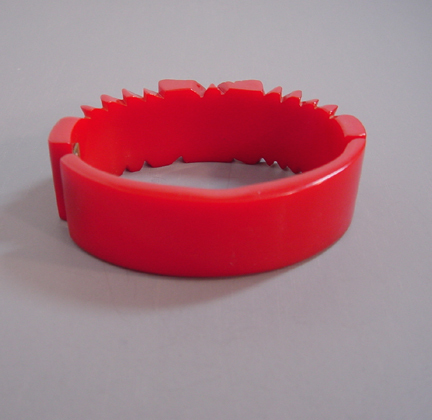 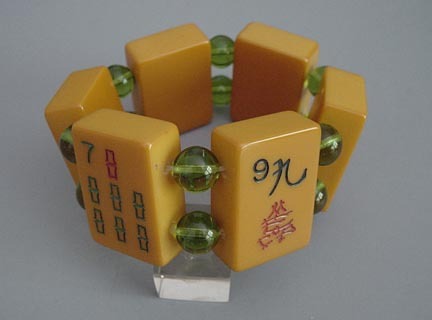 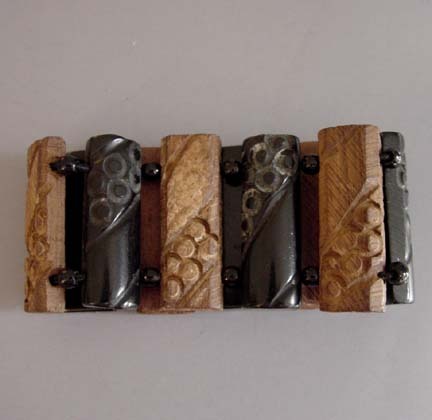 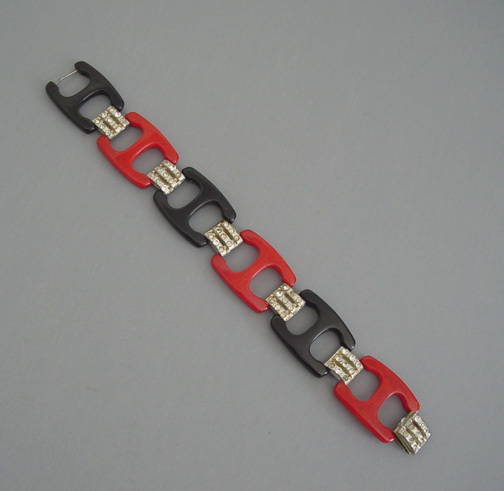 MAH JONG bakelite tiles made into two expansion bracelets. 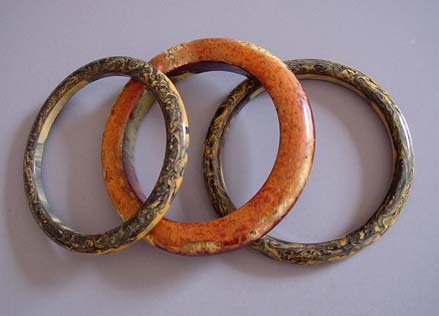 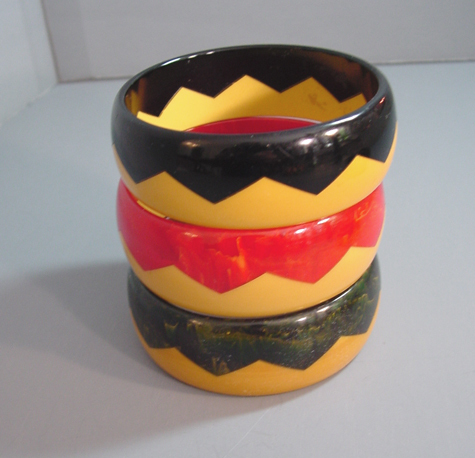 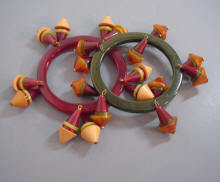 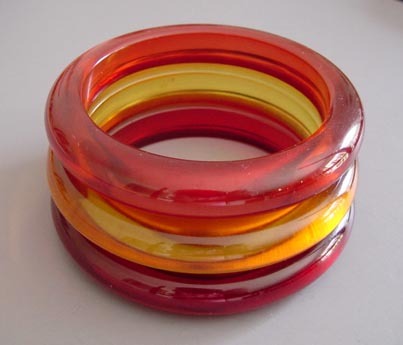 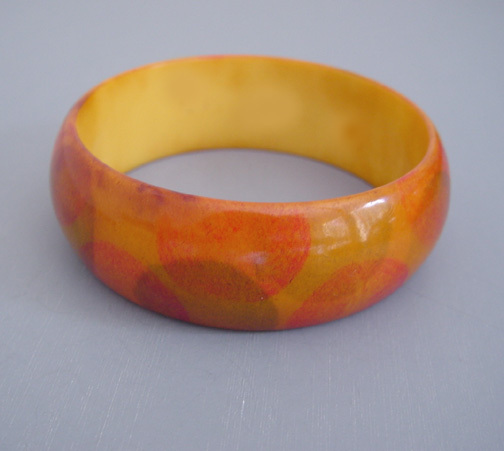 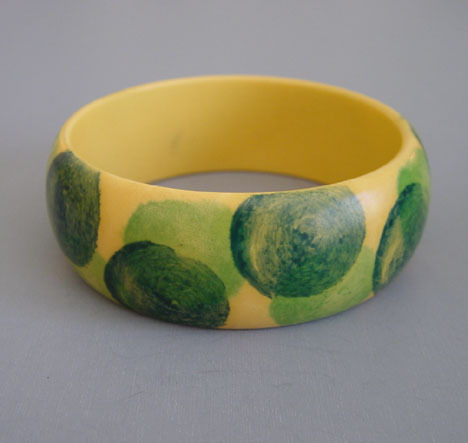 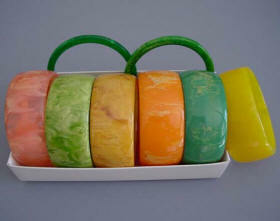 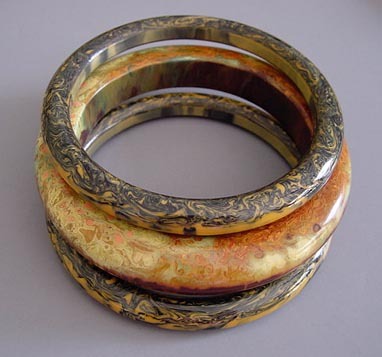 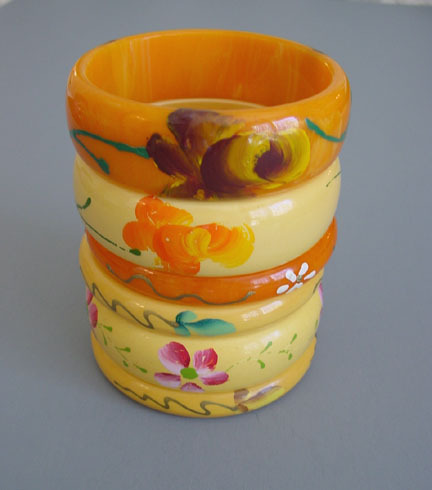 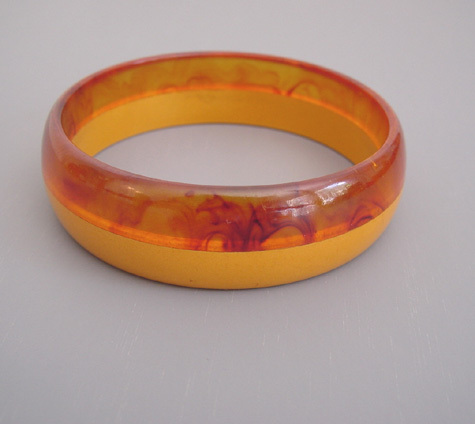 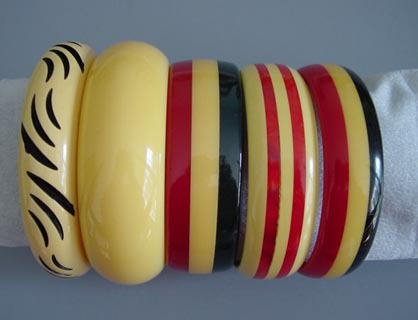 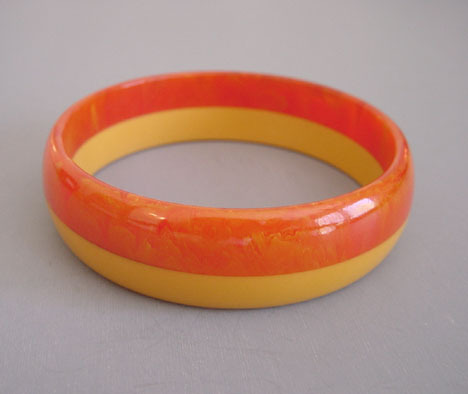 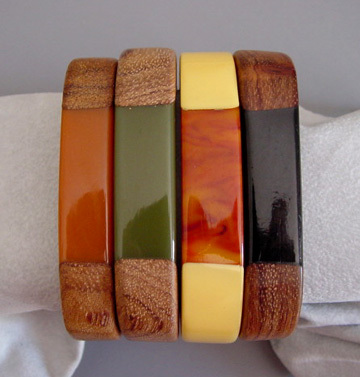 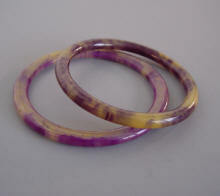 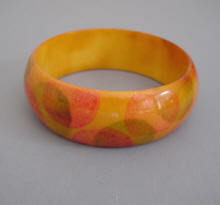 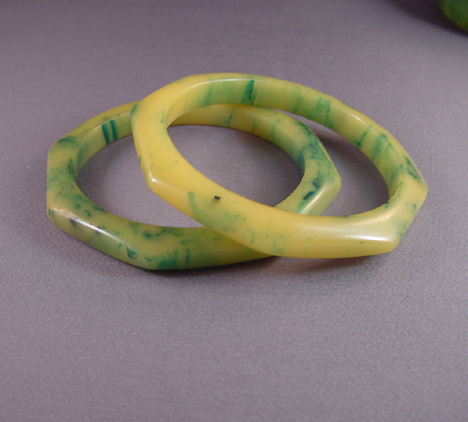 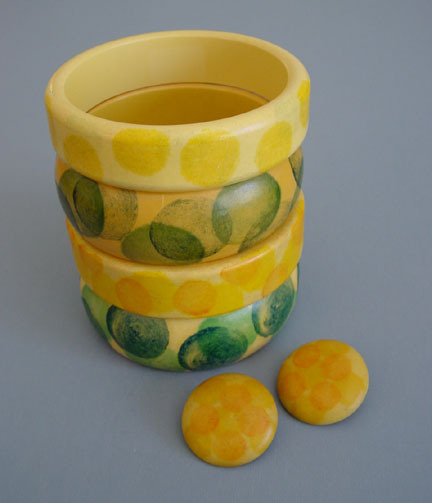 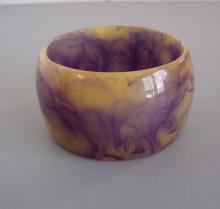 BAKELITE 50s colorful wide marbled bangles. 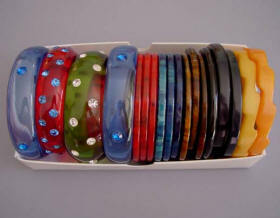 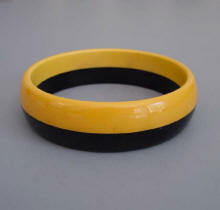 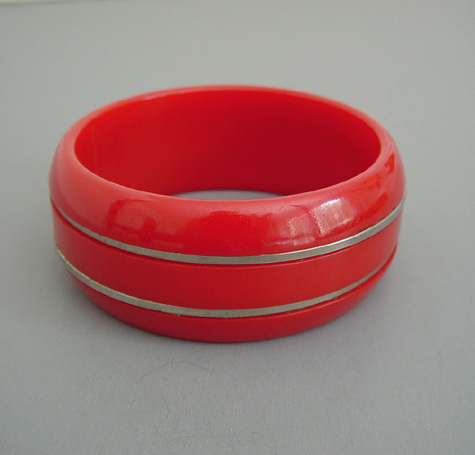 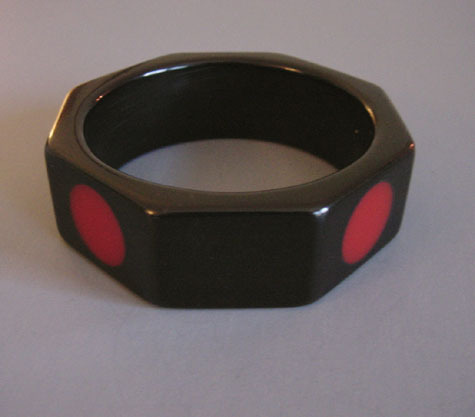 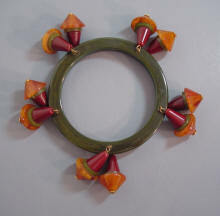 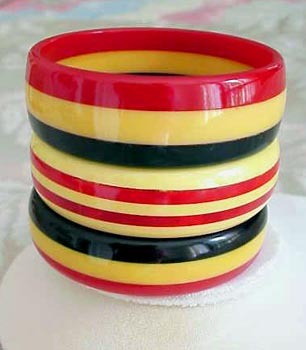 BAKELITE bangle collection.